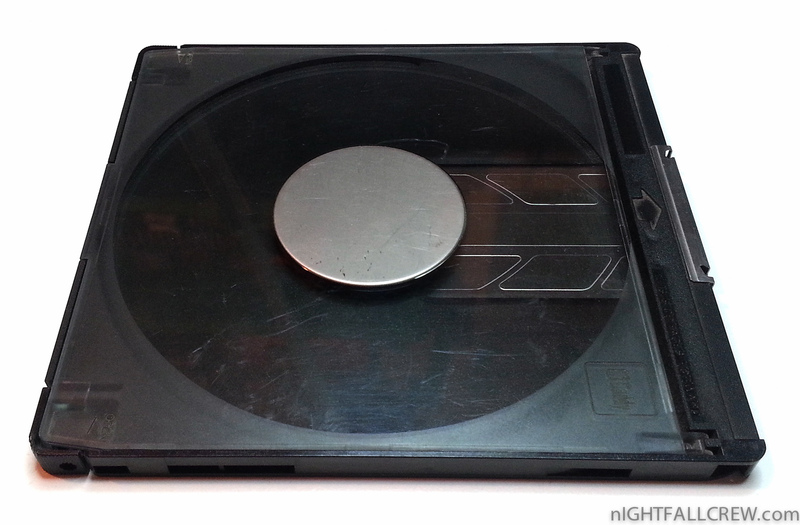 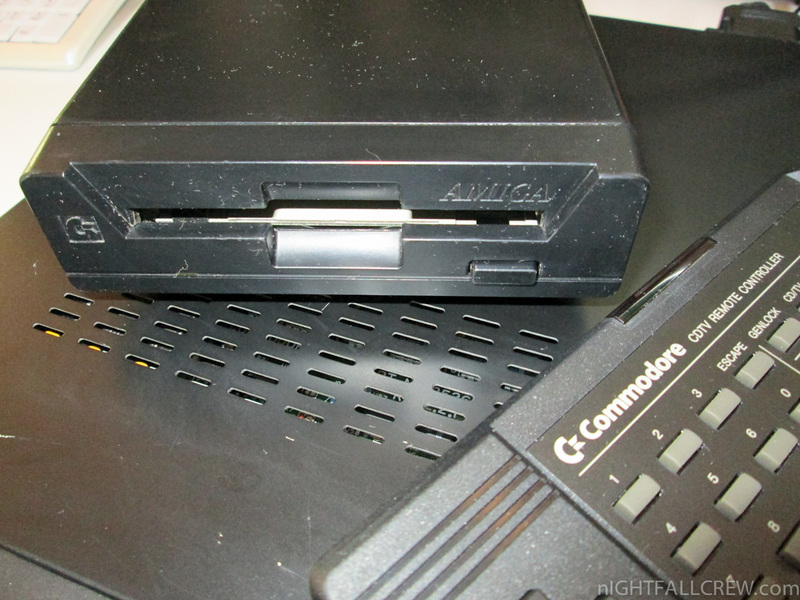 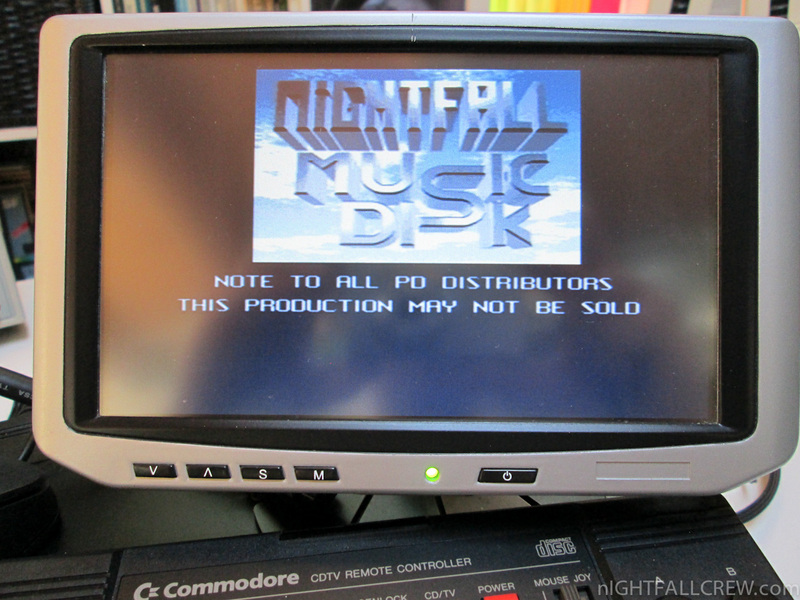 I must thank Andrea Pierdomenico for The original Black CD Caddy for Commodore CDTV. 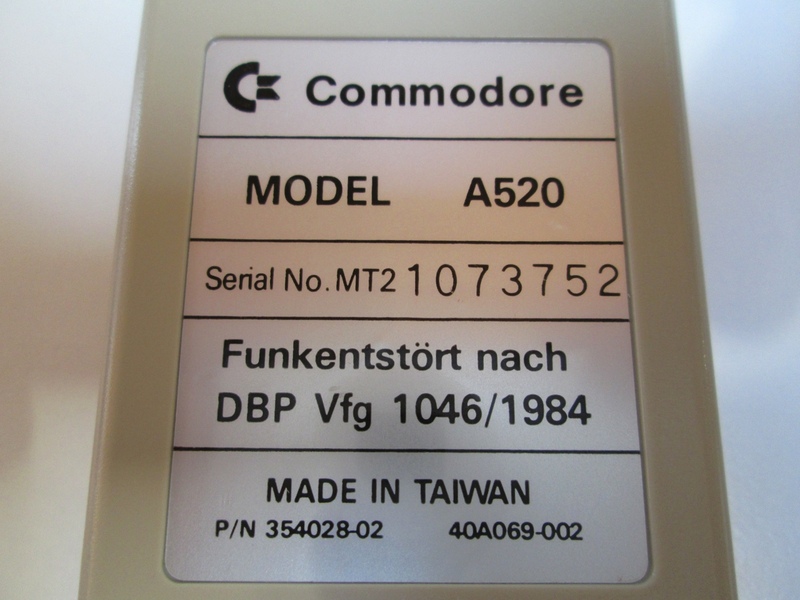 The Commodore CDTV Keyboard it’s nothing more than a Amiga 3000 keyboard, black with a different connector. 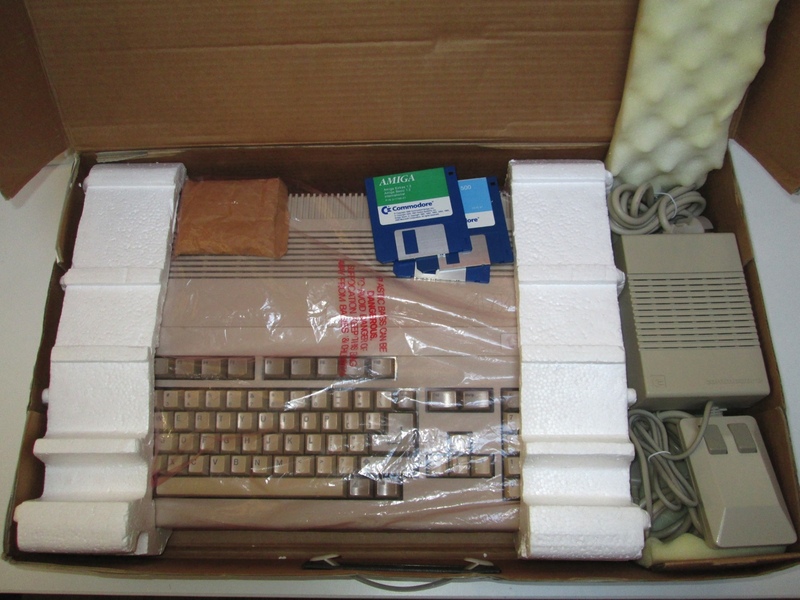 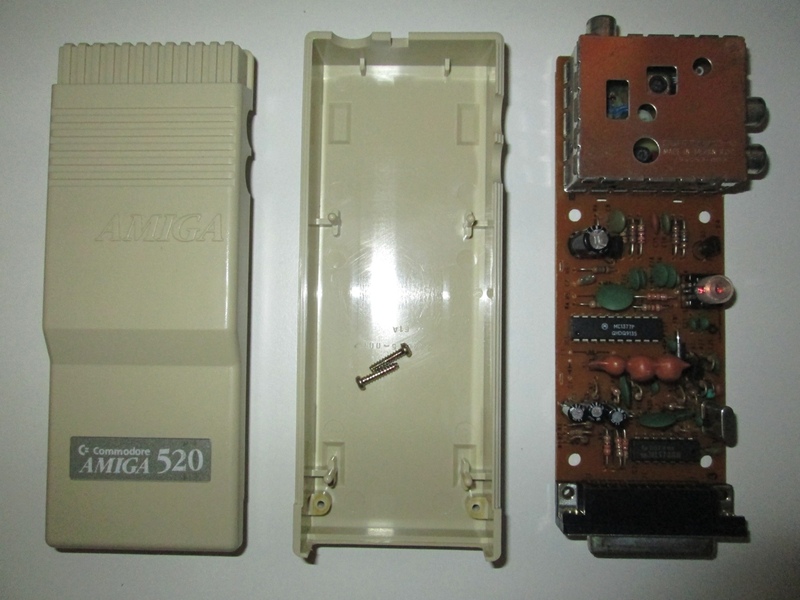 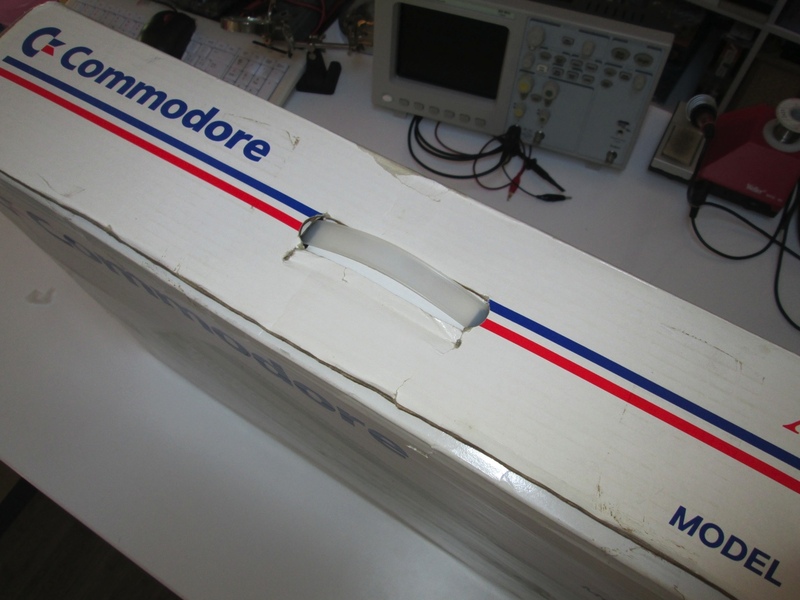 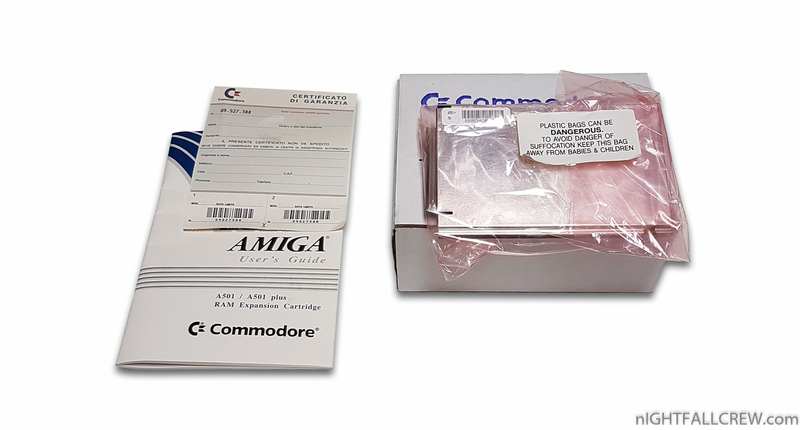 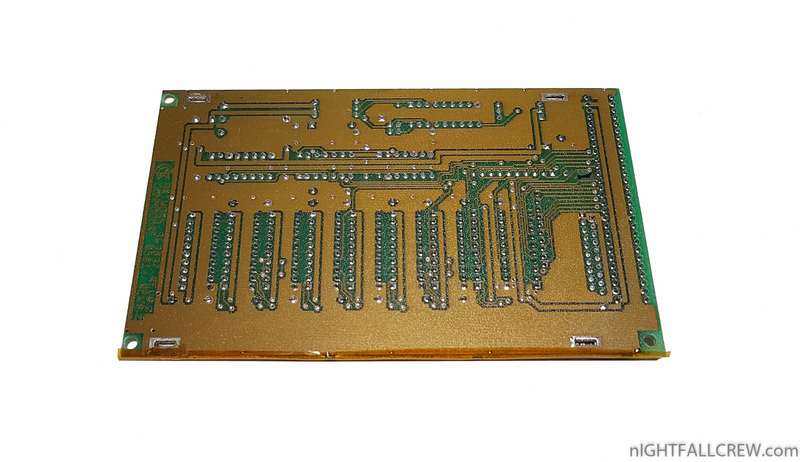 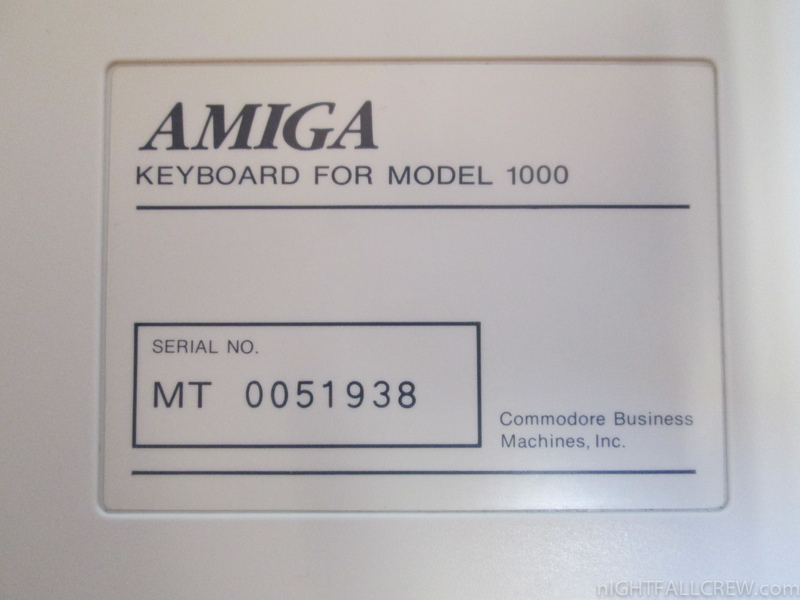 I have received a Commodore Amiga 500 to use as spare parts. 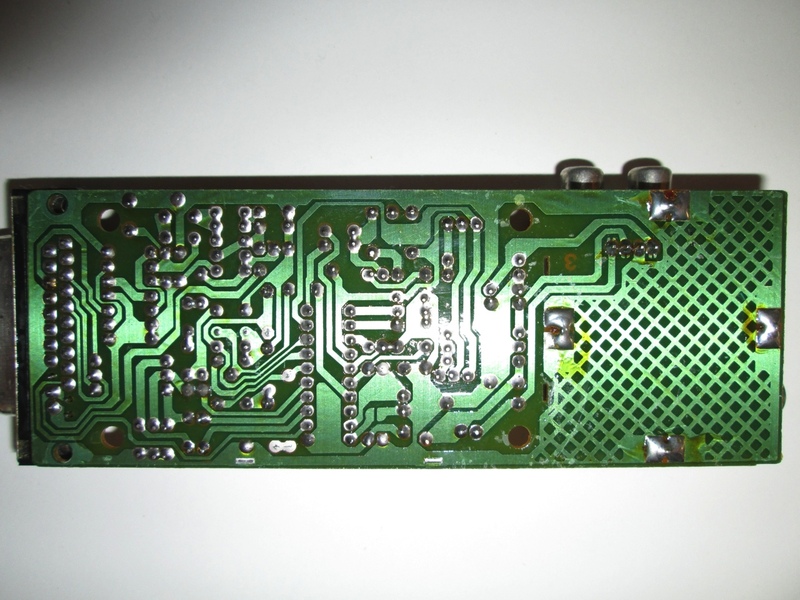 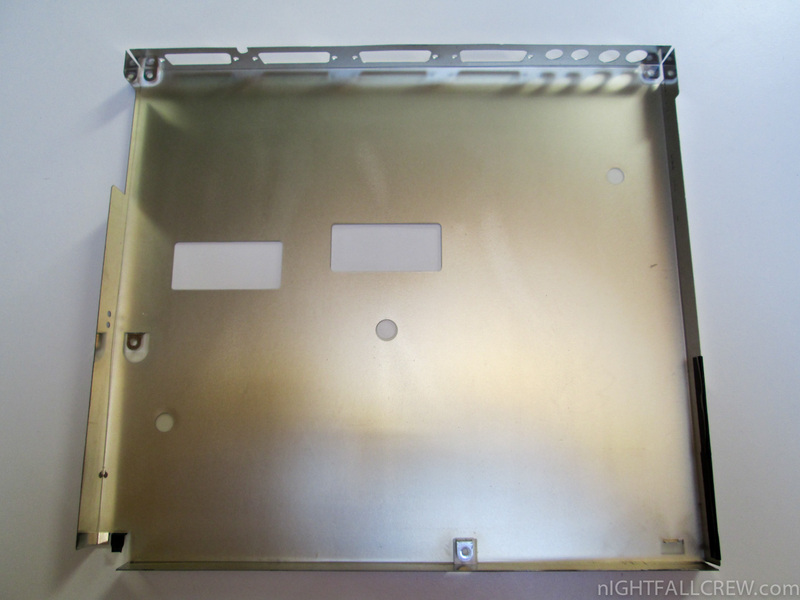 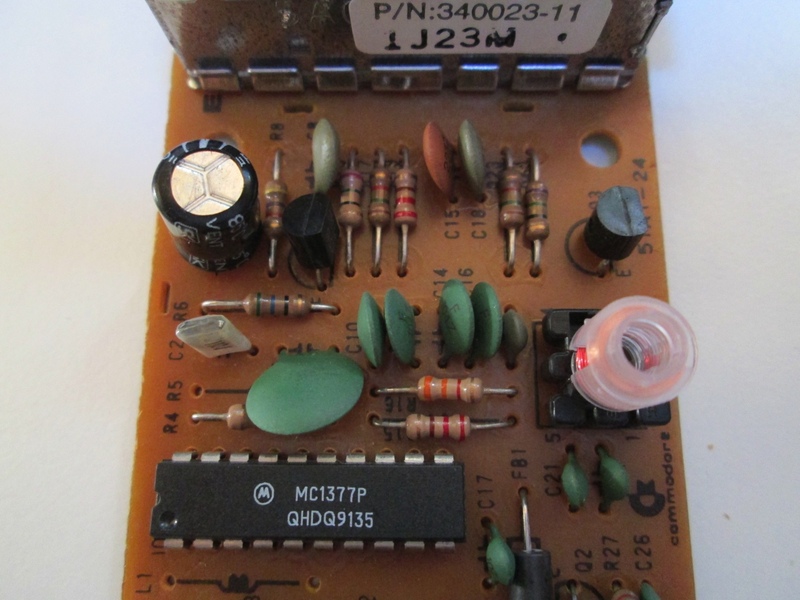 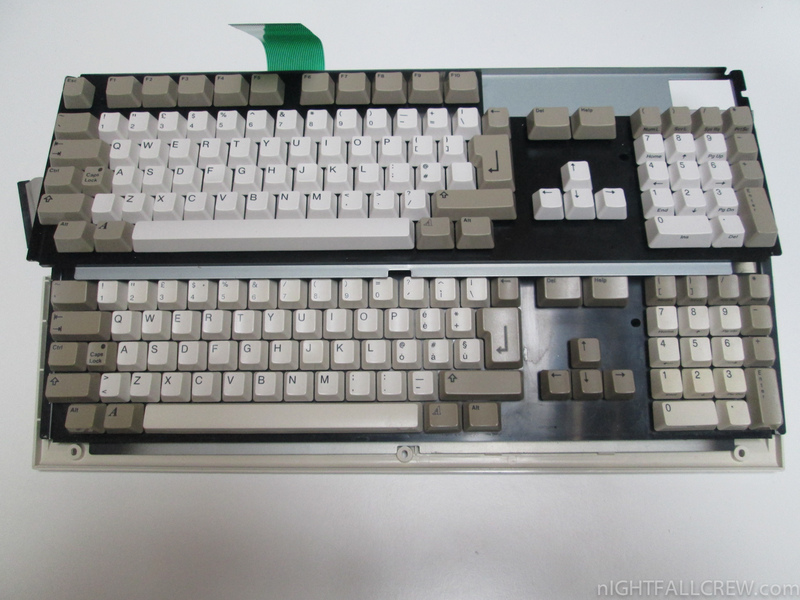 I decided to restore because it’s a ASSY 312512 (Revision 3) with key-switch like IBM chiclet keyboards. 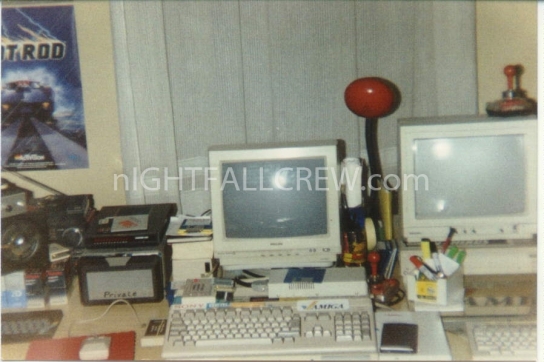 The cleaning took me a whole day but with a great satisfaction at the end of the work. 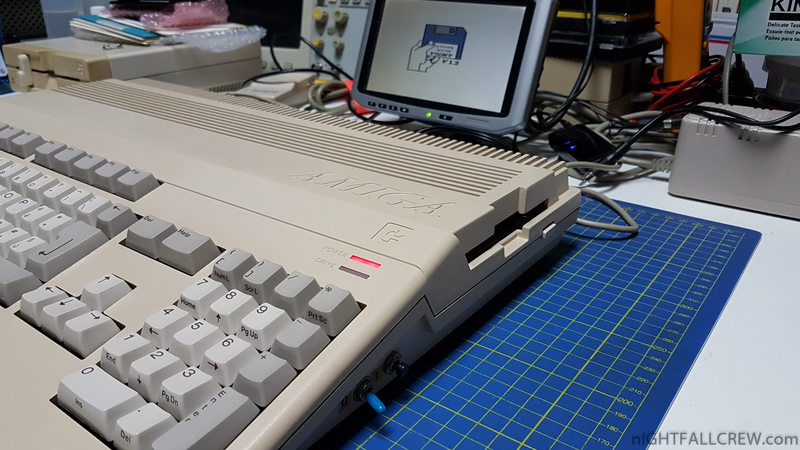 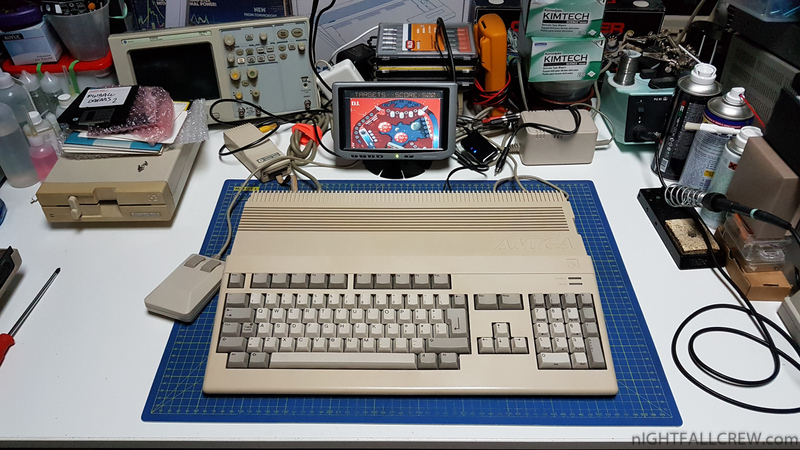 The Commodore Amiga 500 works fine, the floppy drive reads very well and i have added a memory expansion (FAST RAM) of 512k. 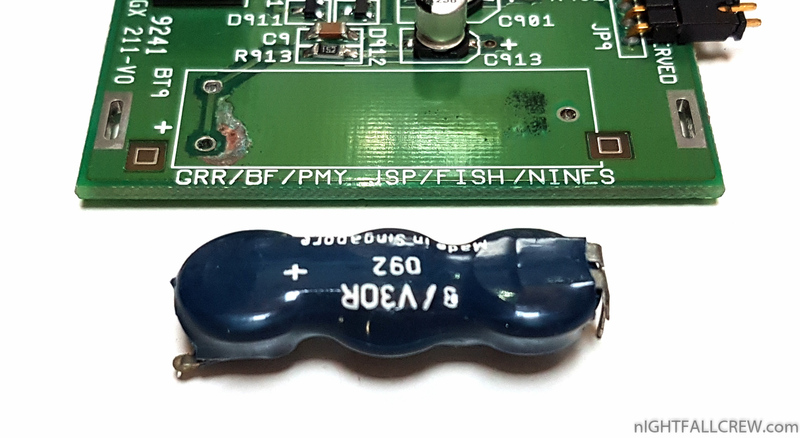 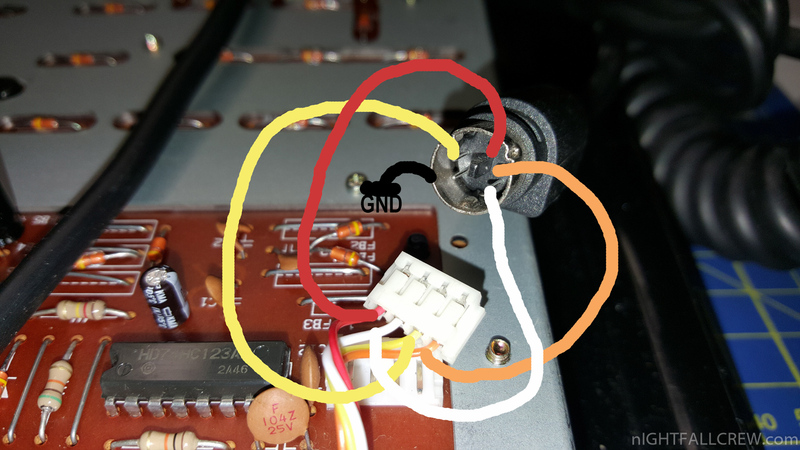 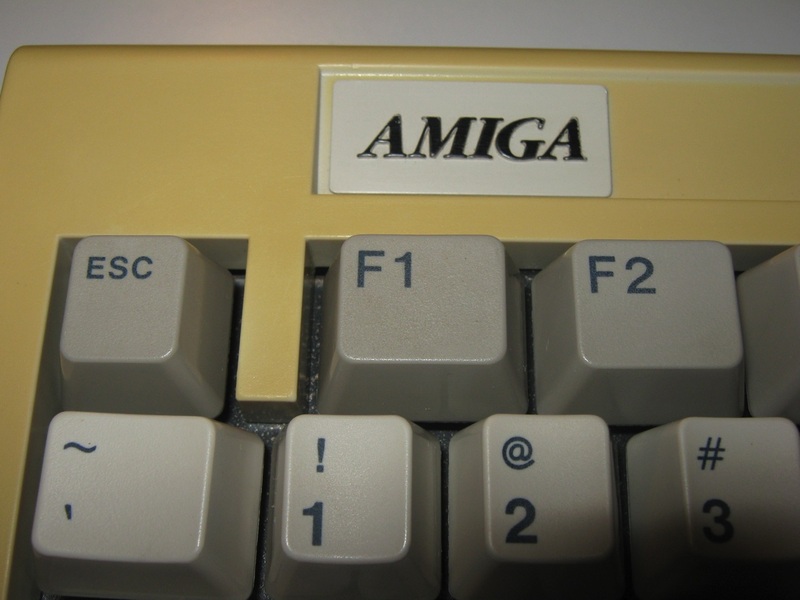 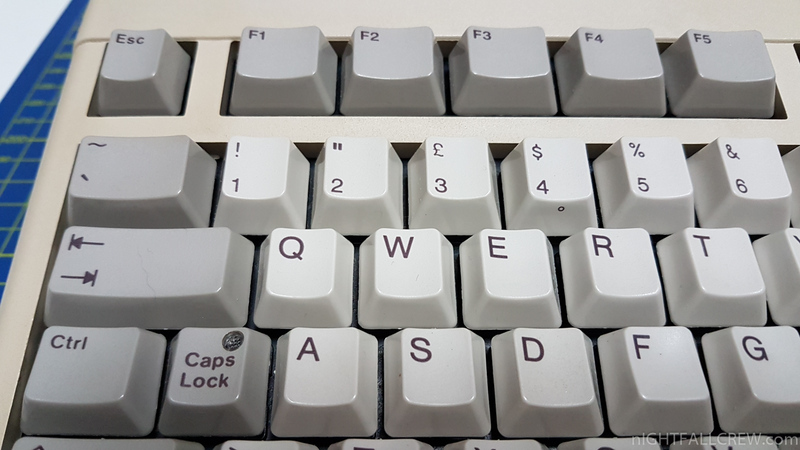 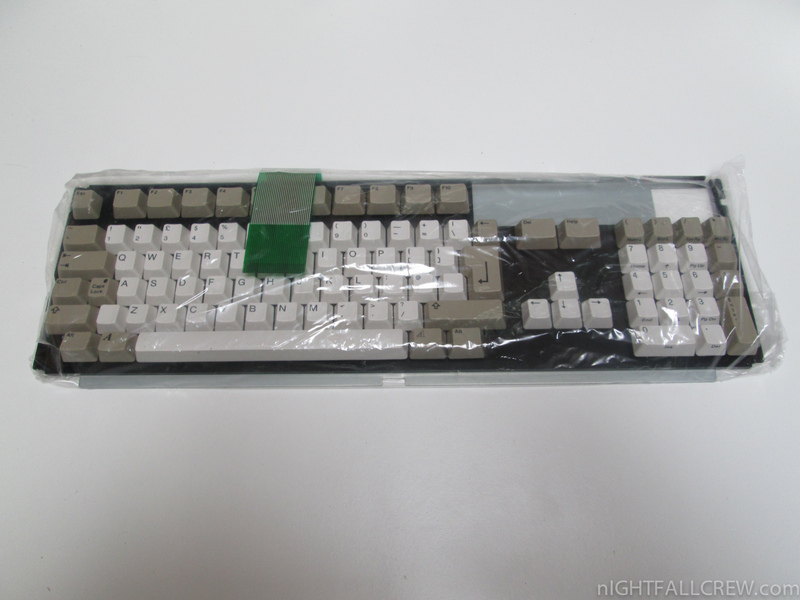 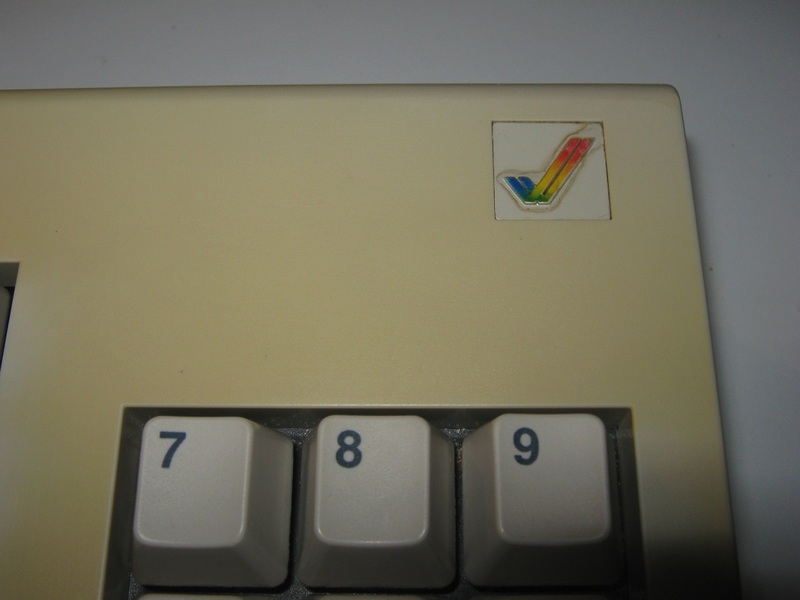 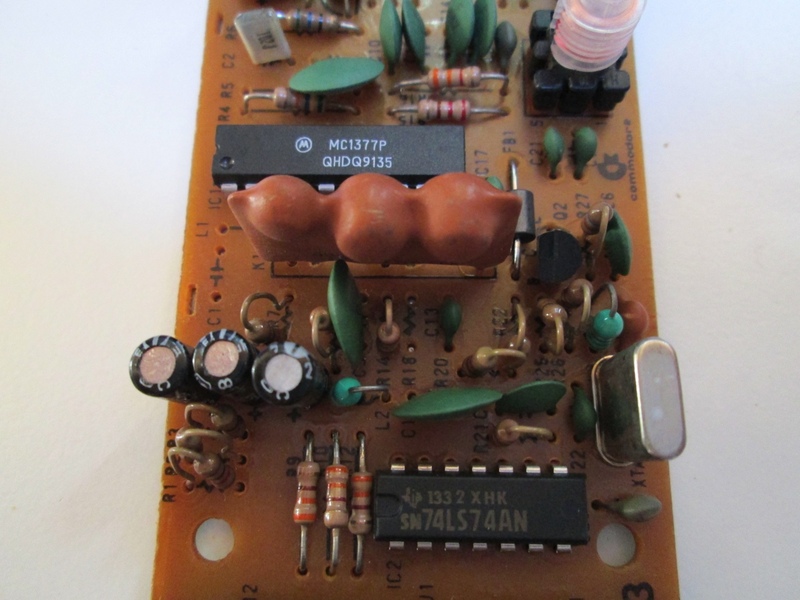 I have decided to replace my Amiga 1000 keyboard (US version) with the space key yellowed and a hole in the plastic caused by a wrong installation with a Amiga 1000 keyboard (Italian version) cosmetically perfect and running. 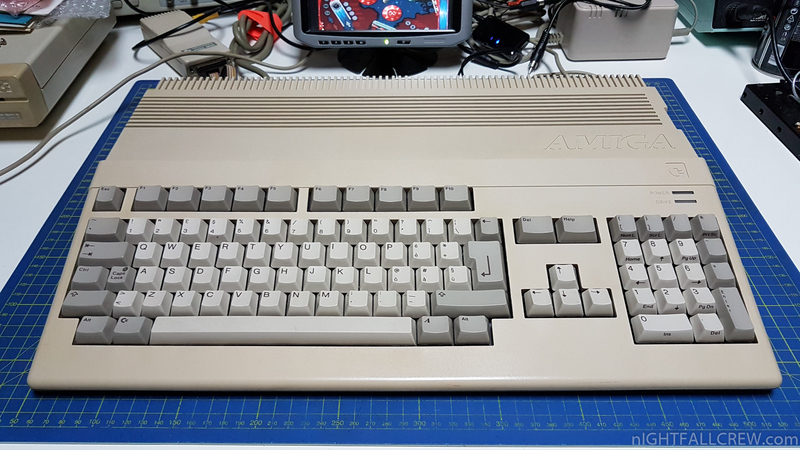 Replaced a old yellowed Amiga 1200 keyboard with a new one. 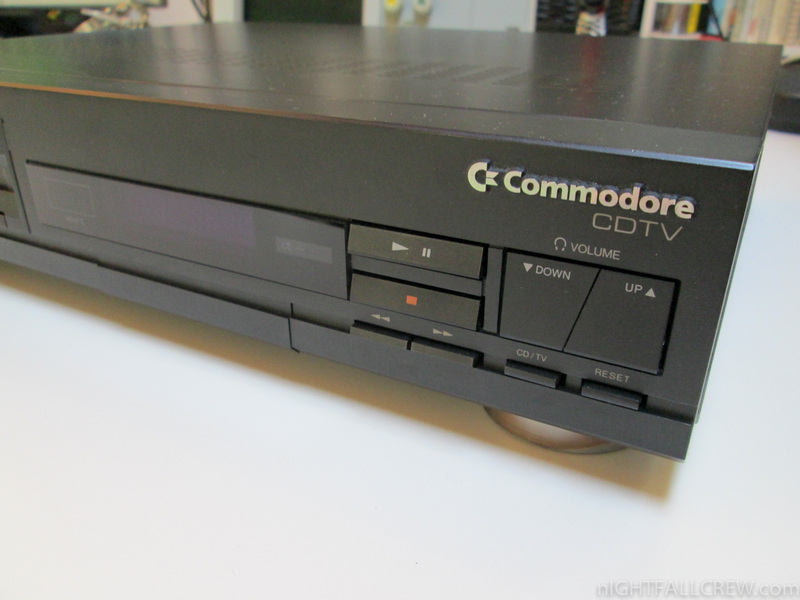 The CDTV (an acronym for “Commodore Dynamic Total Vision”, a backronym of an acronym for “Compact Disk Television”, giving it a double meaning) was a multimedia platform developed by Commodore International and launched in 1991. 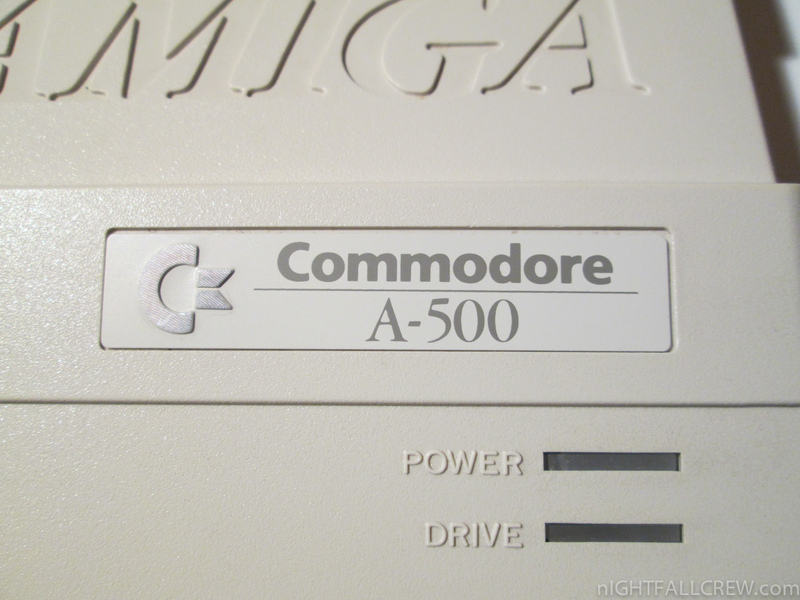 On a technological level it was essentially a Commodore Amiga 500 home computer in a Hi-Fi style case with a single-speed CD-ROM drive. 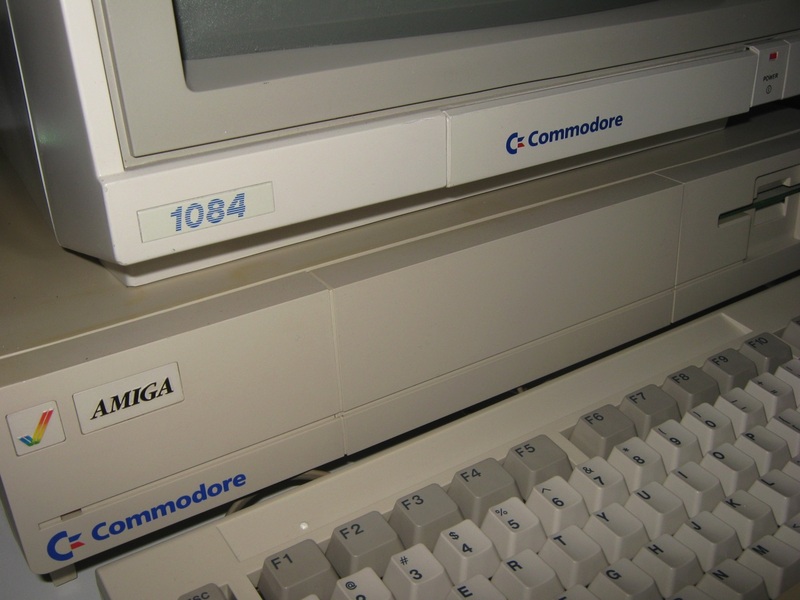 Commodore marketed the machine as an all-in-one home multimedia appliance rather than a computer. 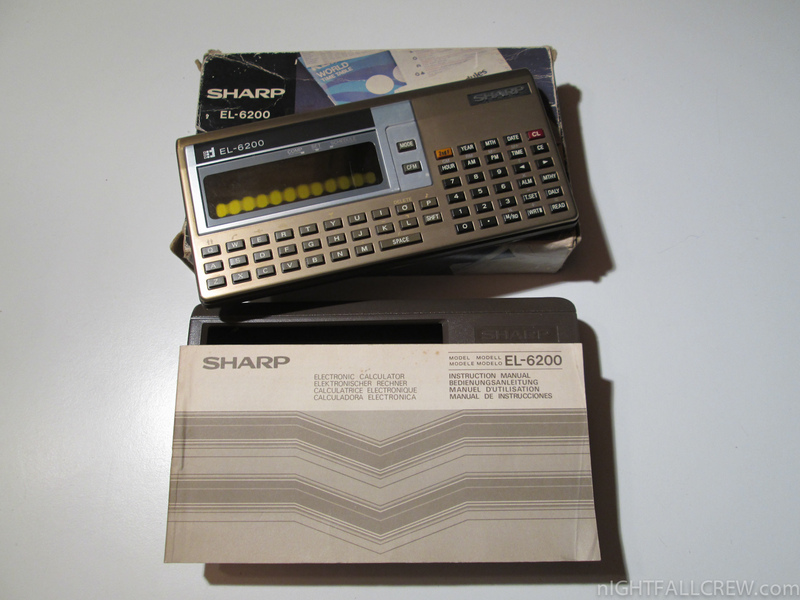 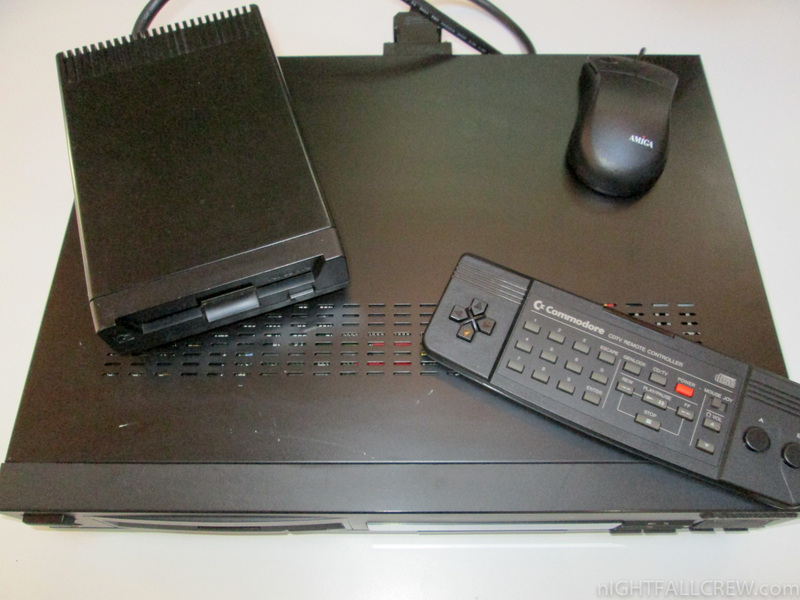 As such, it targeted the same market as the Philips CD-i. 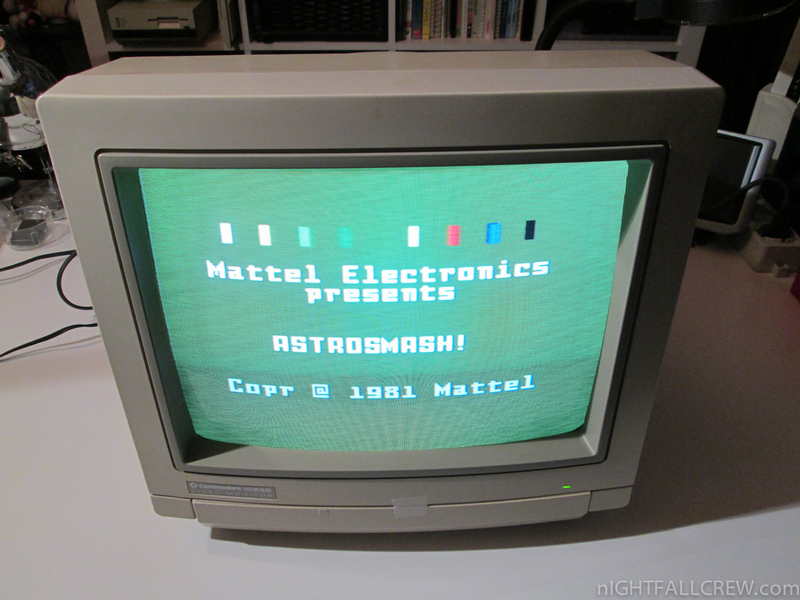 Unfortunately for both Commodore and Philips, the expected market for multimedia appliances did not materialise, and neither machine met with any real commercial success. 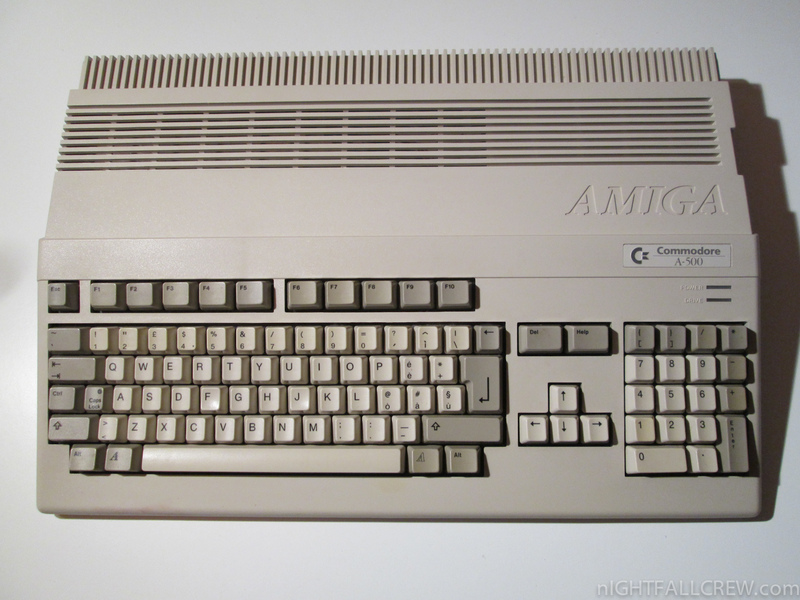 Though the CDTV was based entirely on Amiga hardware it was marketed strictly as a CDTV, with the Amiga name omitted from product branding. 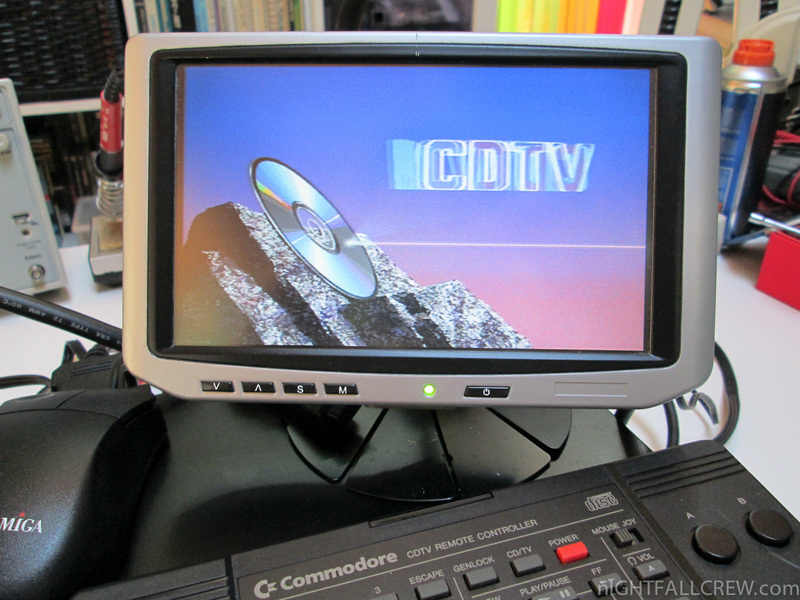 The CDTV debuted in North America in March 1991 (CES, Las Vegas) and in the UK (World of Commodore 1991 at Earls Court, London). 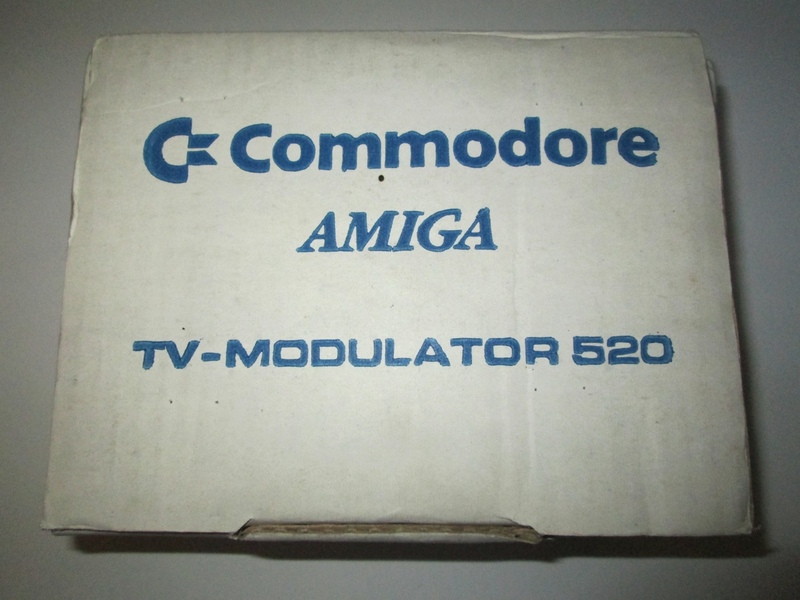 It was advertised at £499 for the CDTV unit, remote control and two titles. 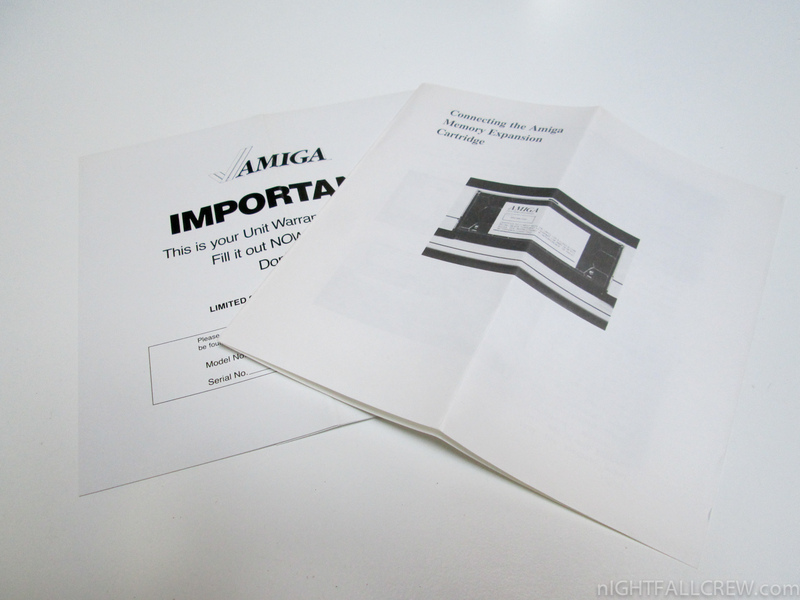 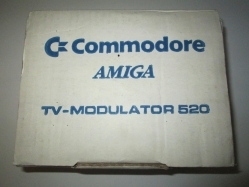 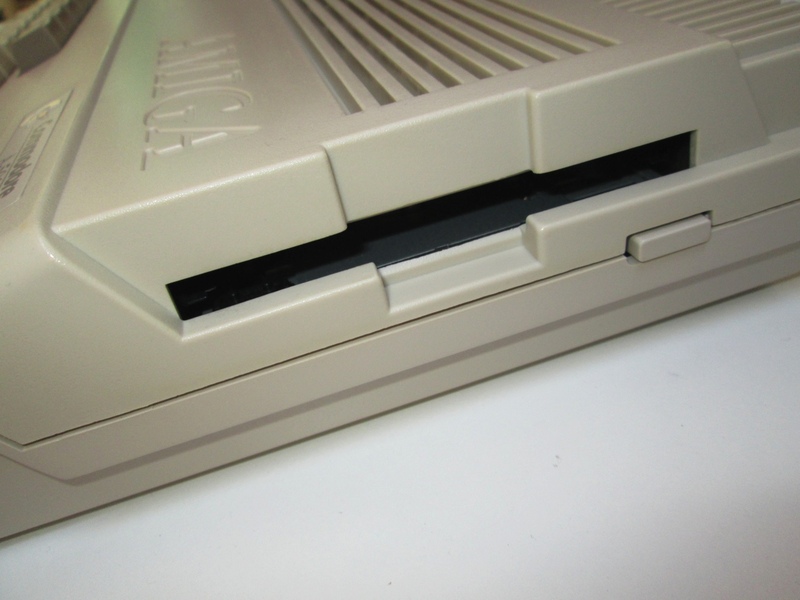 Commodore chose Amiga enthusiast magazines as its chief advertising channel, but the Amiga community on the whole avoided the CDTV in the expectation of an add-on CD-ROM drive for the Amiga, which eventually came in the form of the A570. 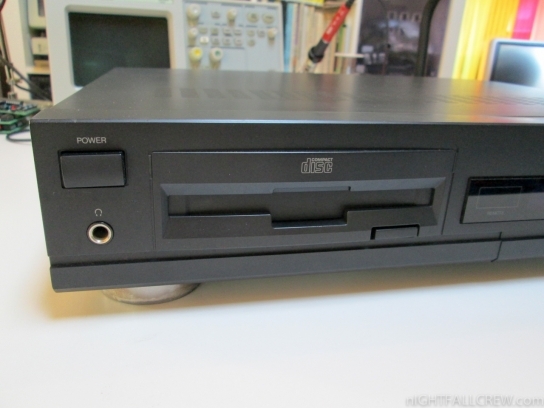 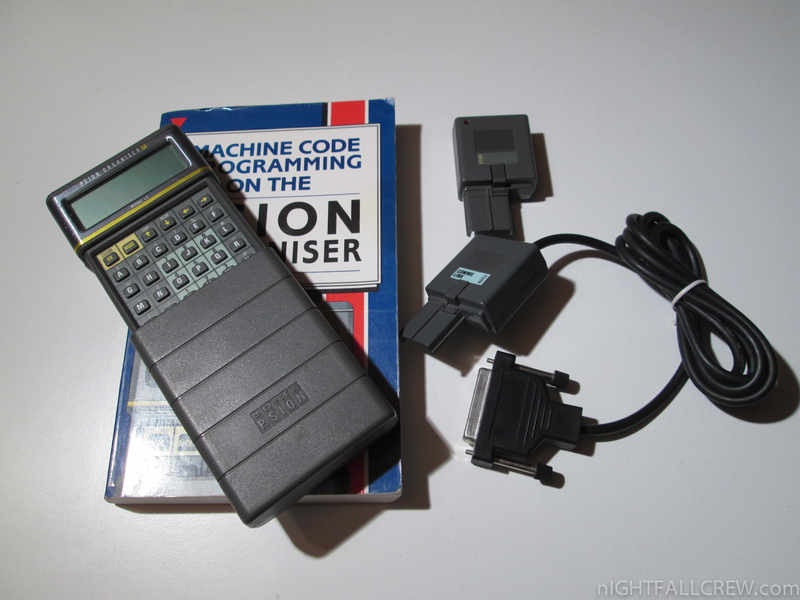 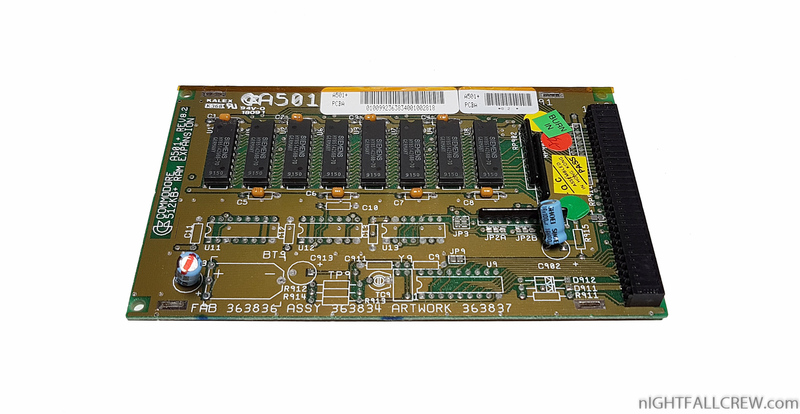 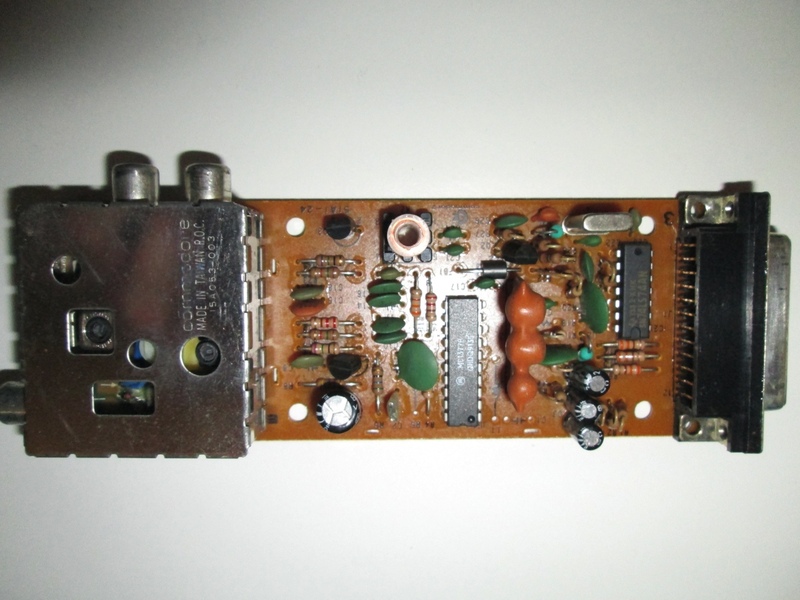 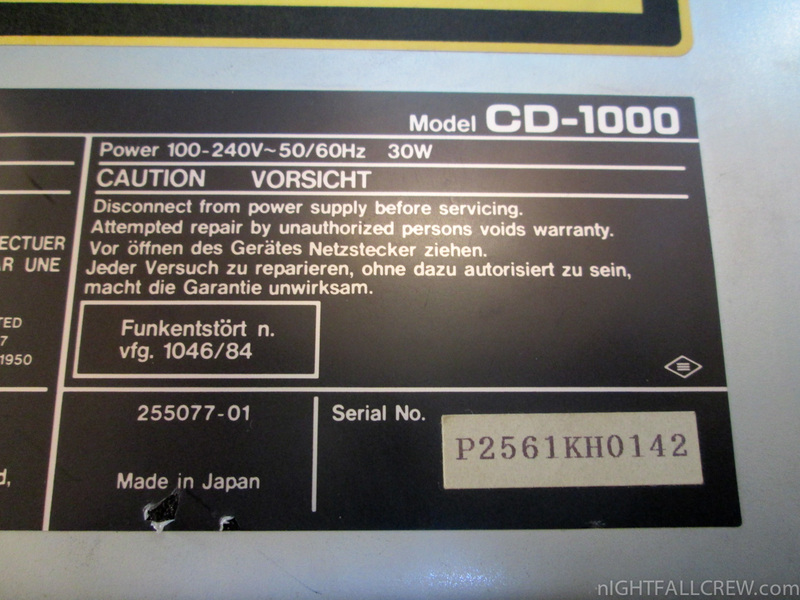 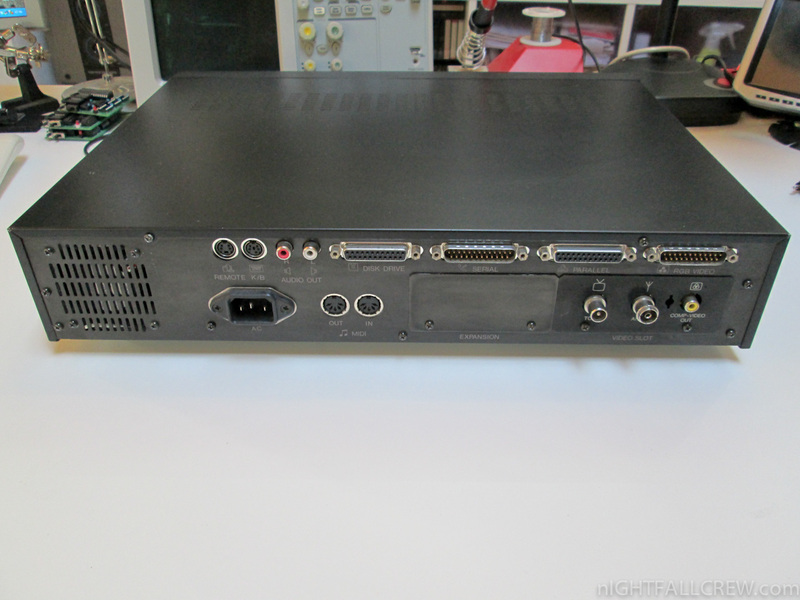 This further hurt sales of the CDTV, as both it and an A570-equipped A500 were the same electronically, and could both run CDTV software, so there was very little motivation to buy it. 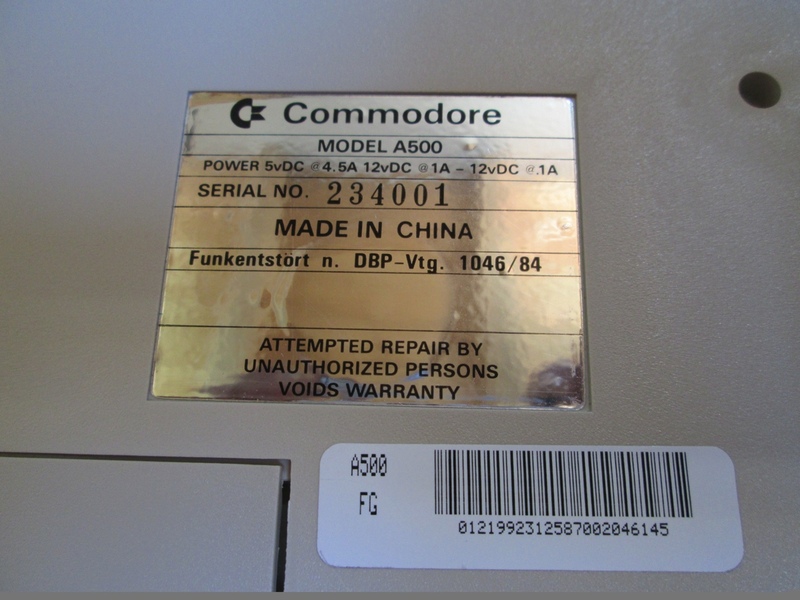 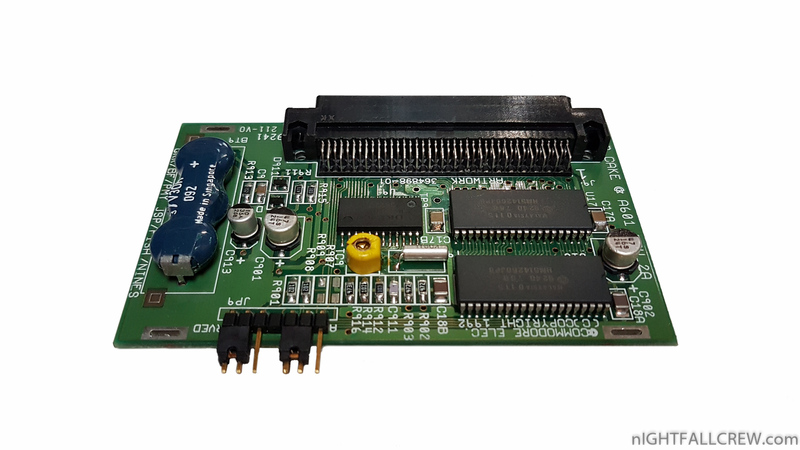 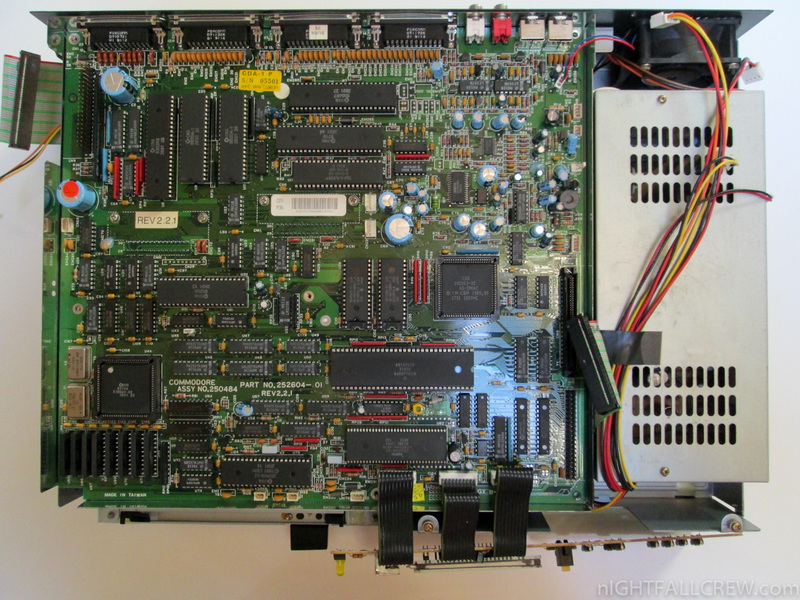 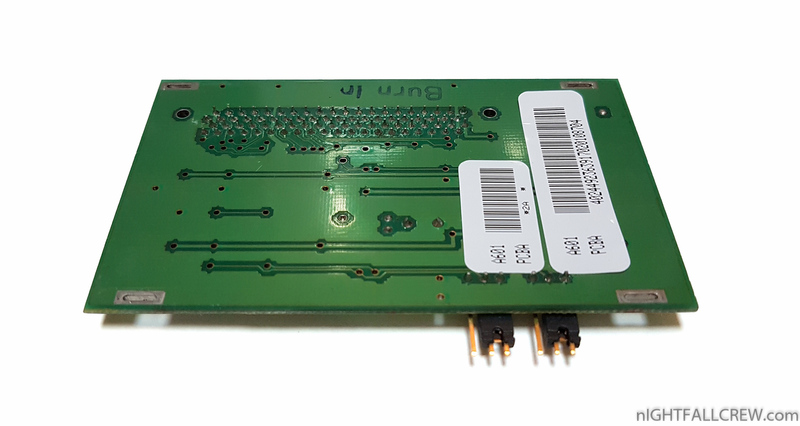 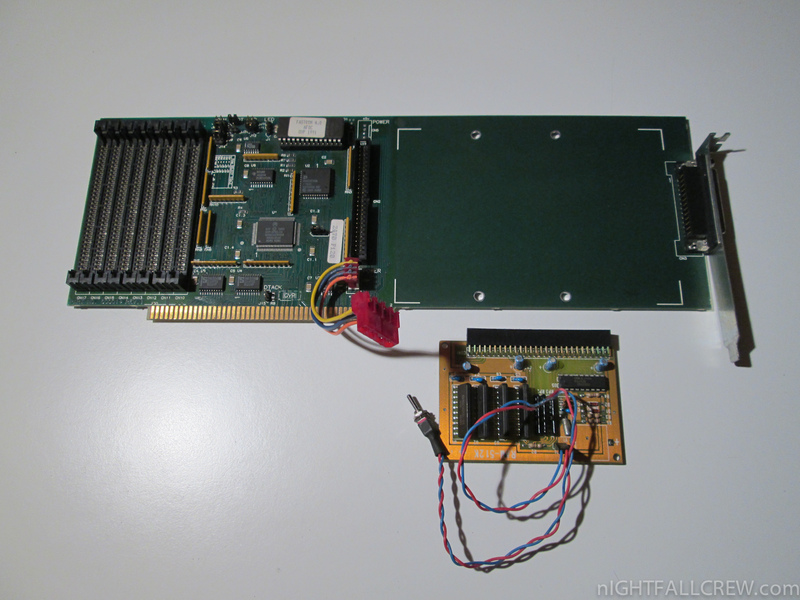 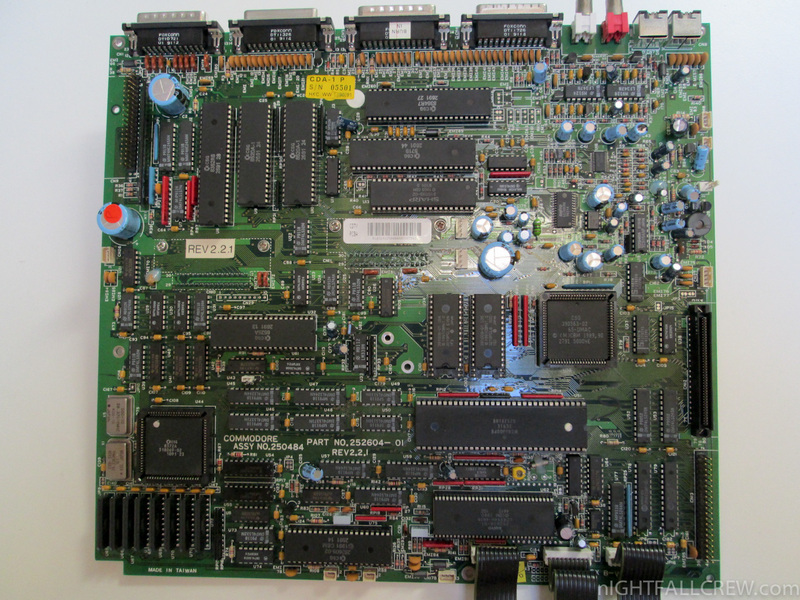 Commodore would rectify this with CDTV’s successor, the A1200-based Amiga CD32, by adding the Akiko chip. 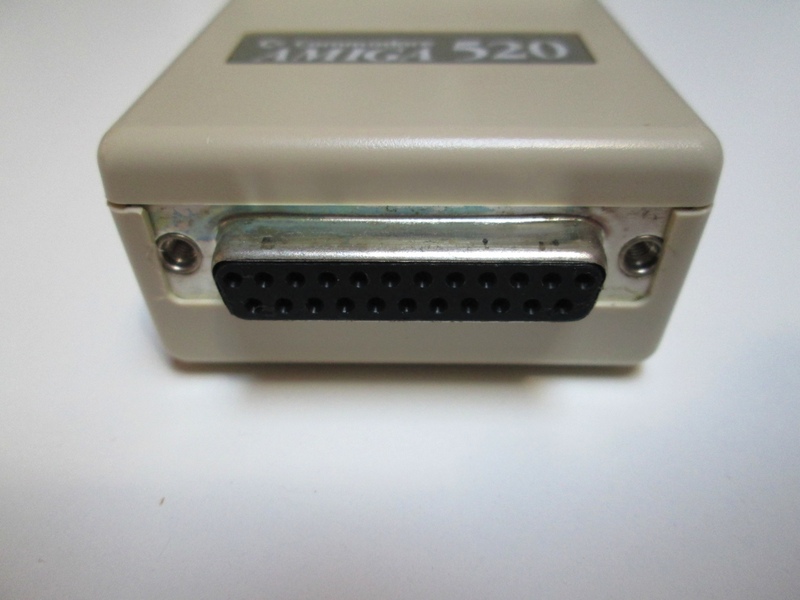 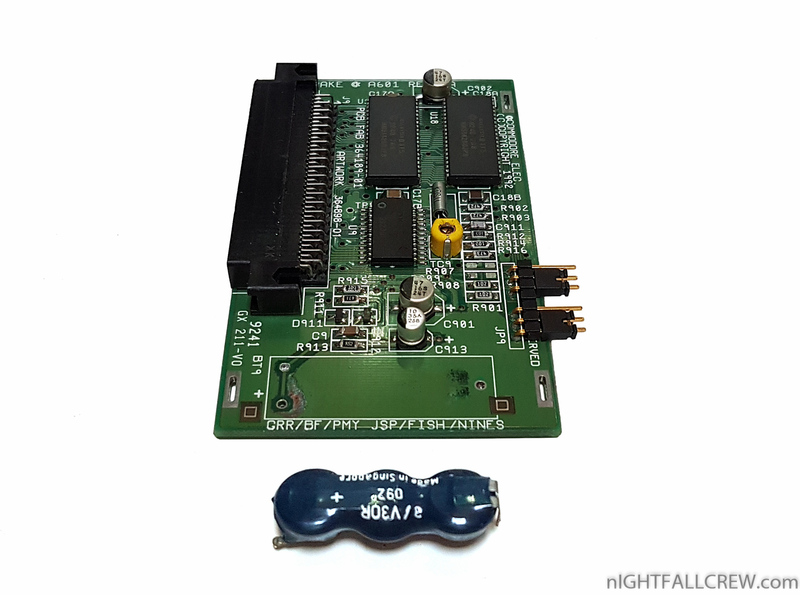 This would enable CD32 games to be playable only on the CD32. 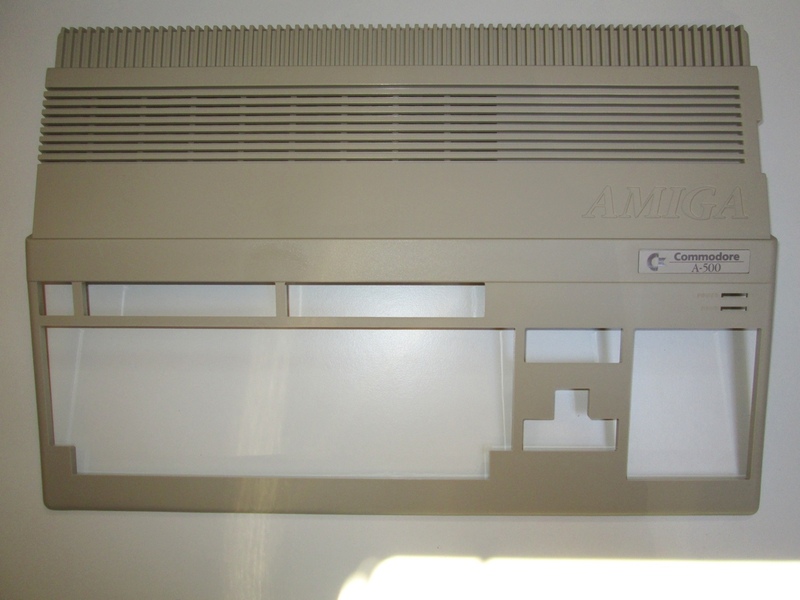 The CDTV was supplied with AmigaOS 1.3, rather than the more advanced and user-friendly 2.0 release that was launched at around the same time. 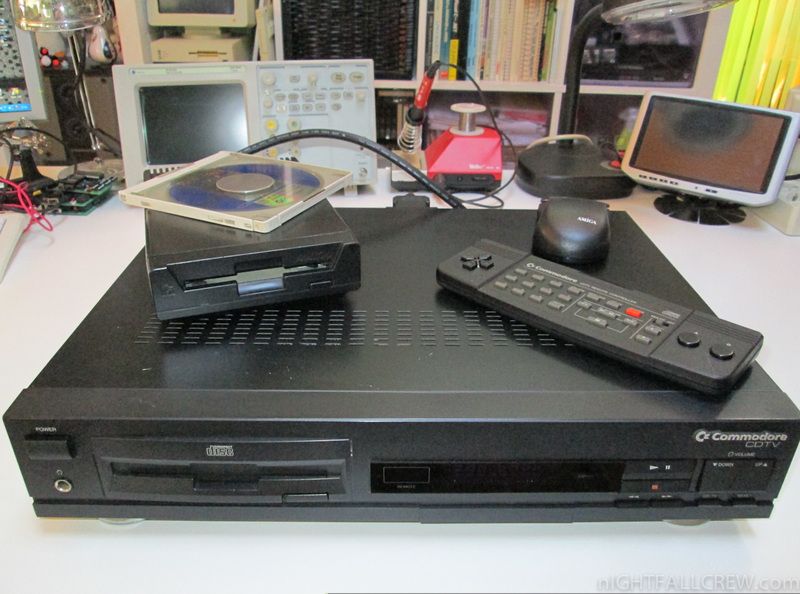 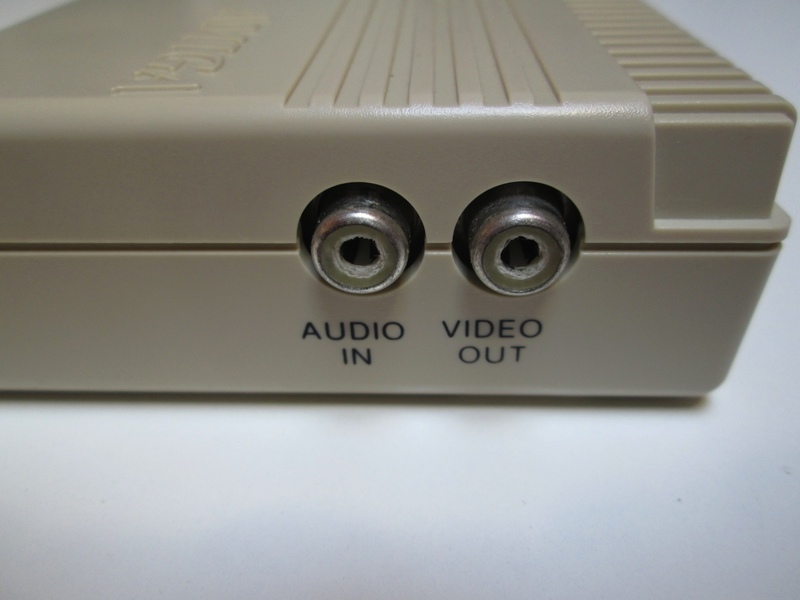 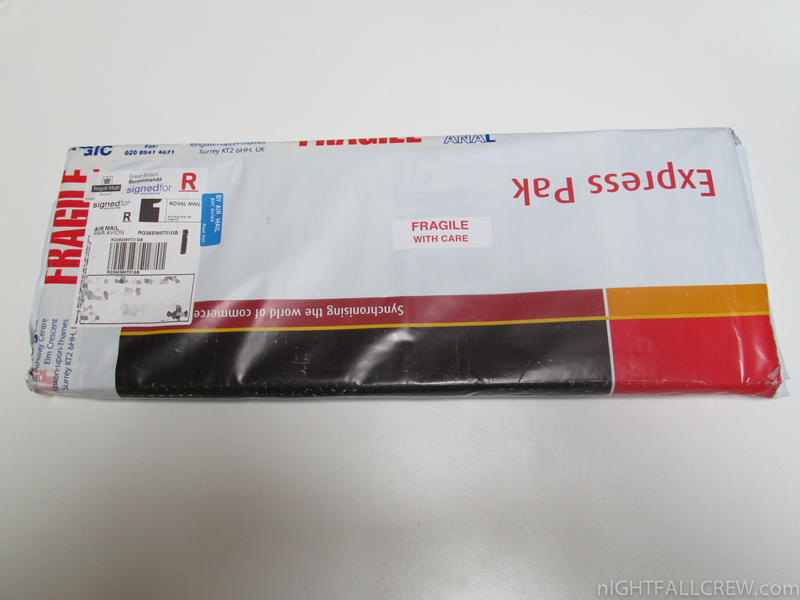 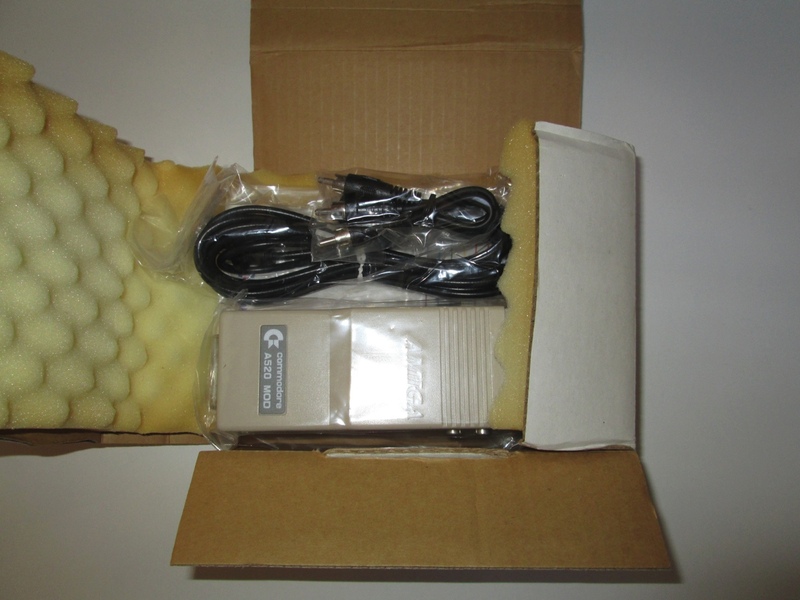 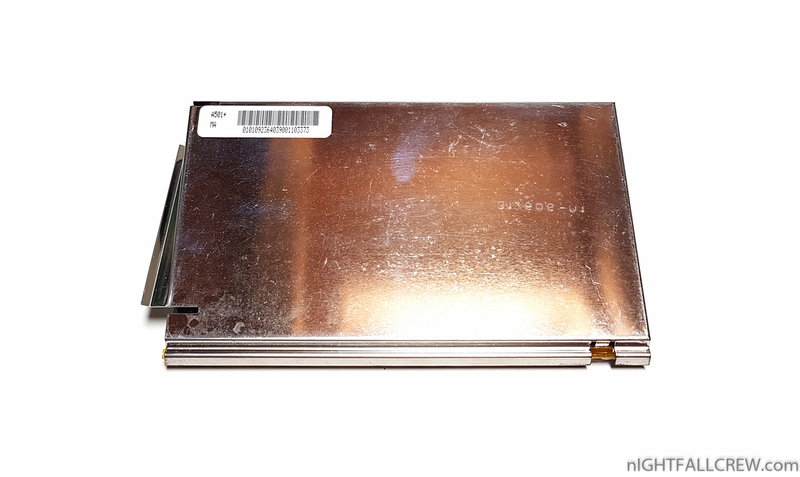 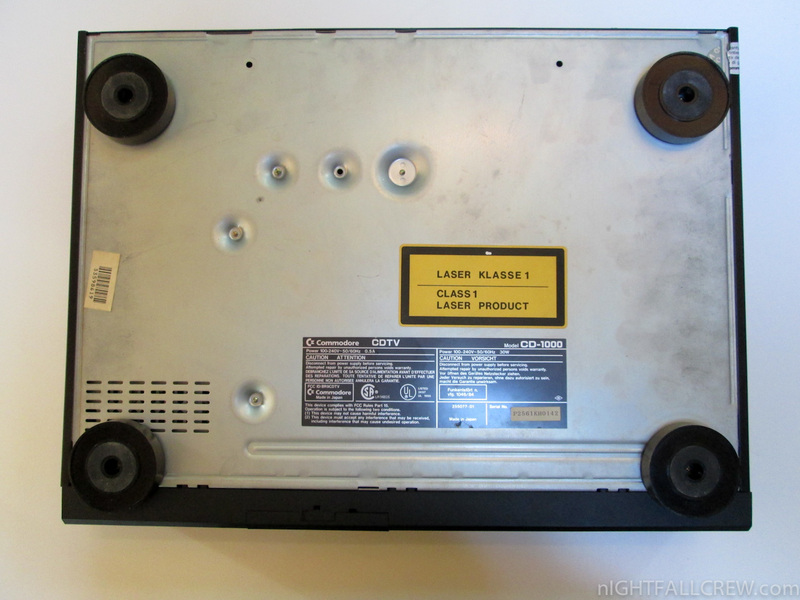 Notably, the CDXL motion video format was primarily developed for the CDTV making it one of the earliest consumer systems to allow video playback from CD-ROM. 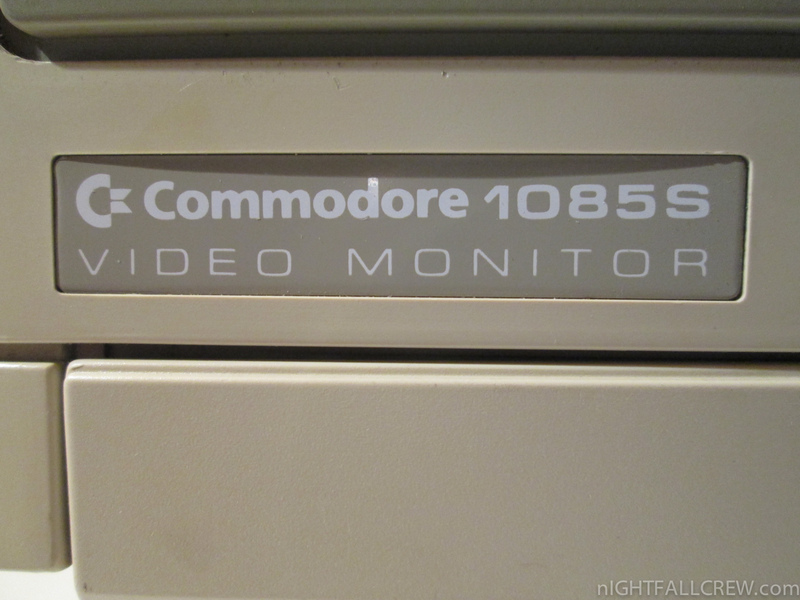 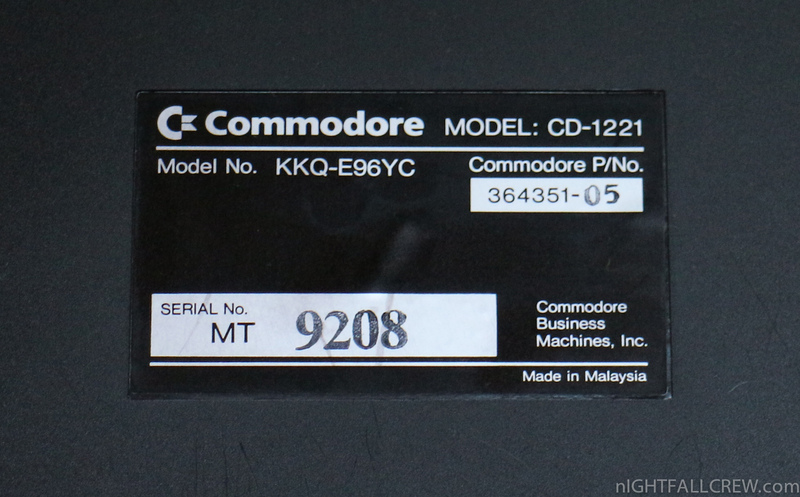 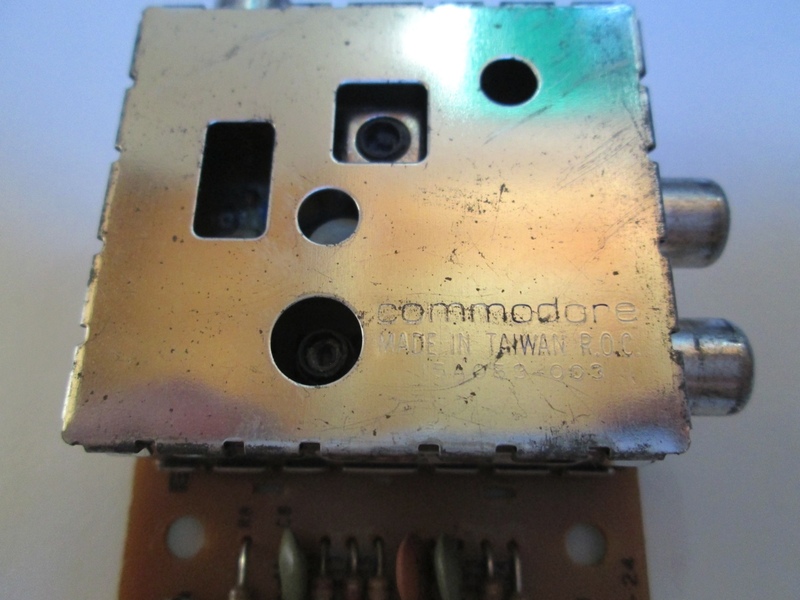 Though Commodore later developed an improved and cost-reduced CDTV-II it was never released. 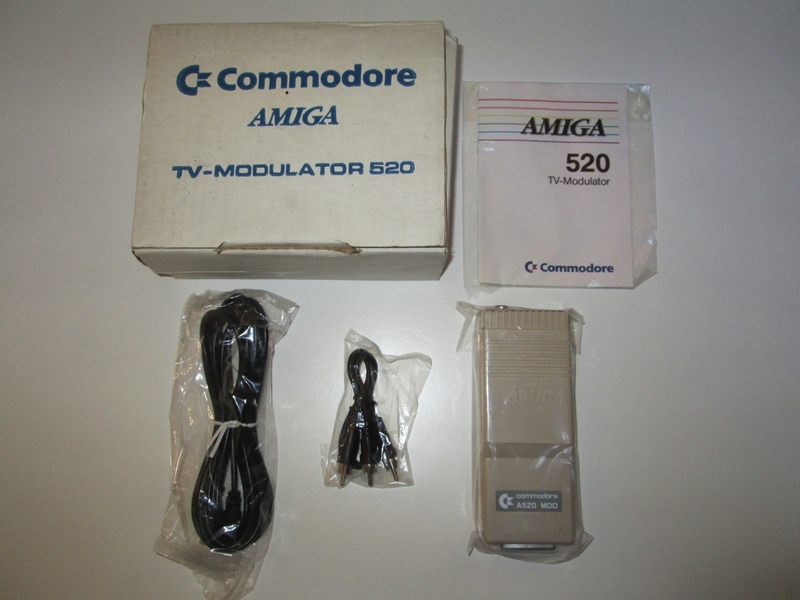 Commodore eventually discontinued the CDTV in 1993 with the launch of the Amiga CD32, which used which again was substantially based on Amiga hardware (in this case the newer Amiga 1200) but explicitly targeted the games market. 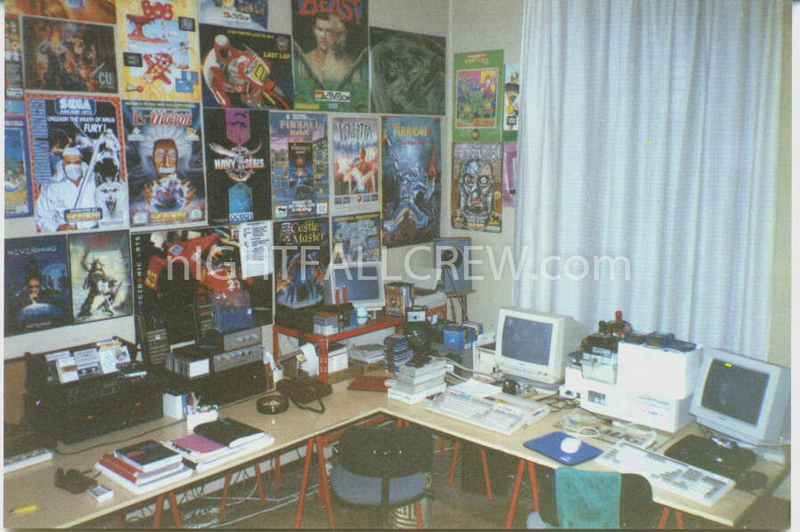 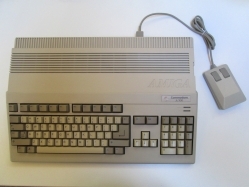 The Amiga 500 – also known as the A500 (or its code name ‘Rock Lobster’) – was the first “low-end” Commodore Amiga 16/32-bit multimedia home/personal computer. 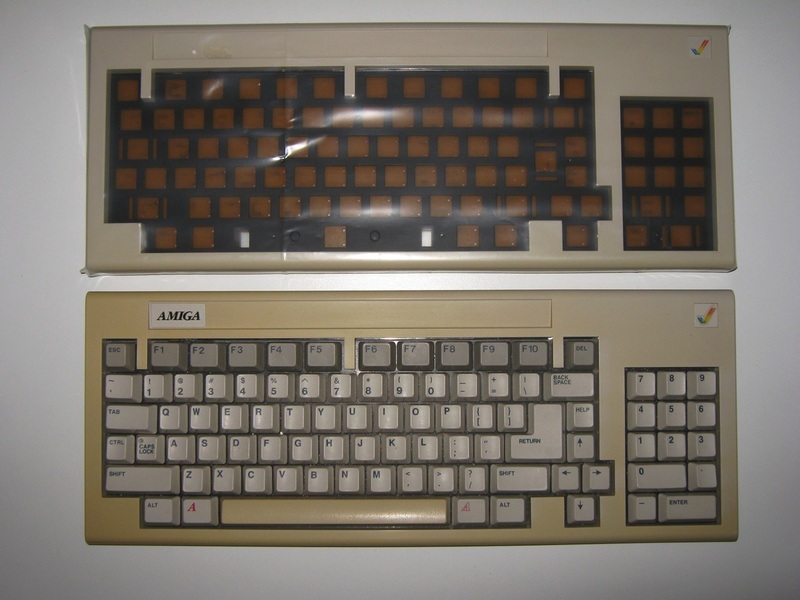 It was announced at the winter Consumer Electronics Show in January 1987 – at the same time as the high-end Amiga 2000 – and competed directly against the Atari 520ST. 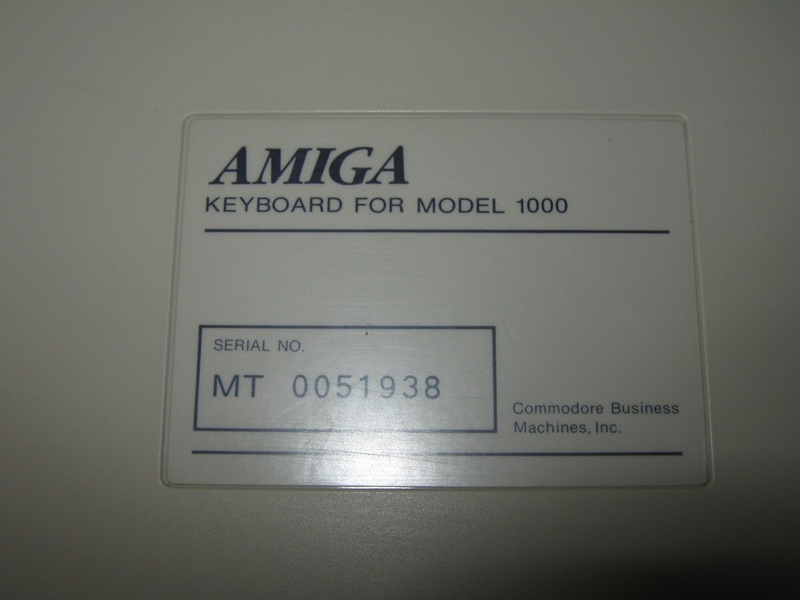 Before Amiga 500 was shipped, Commodore suggested that the list price of the Amiga 500 was 595.95 USD without a monitor. 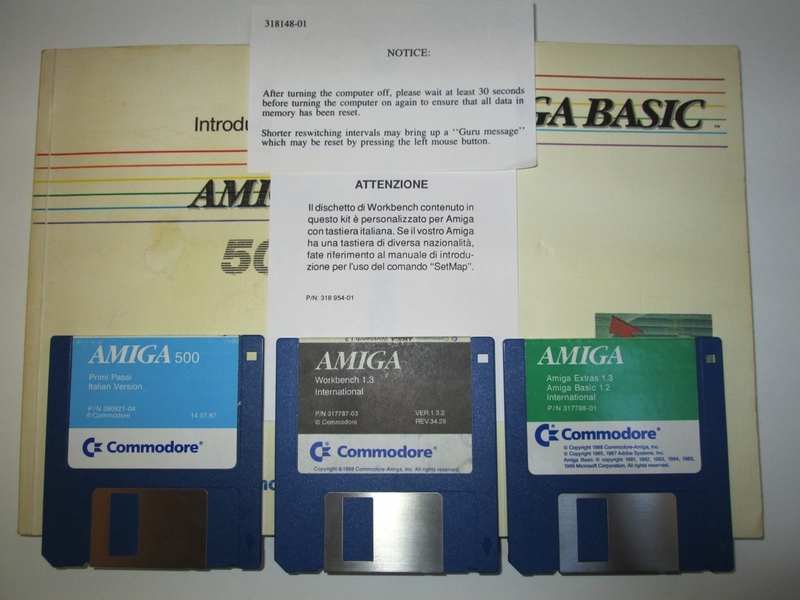 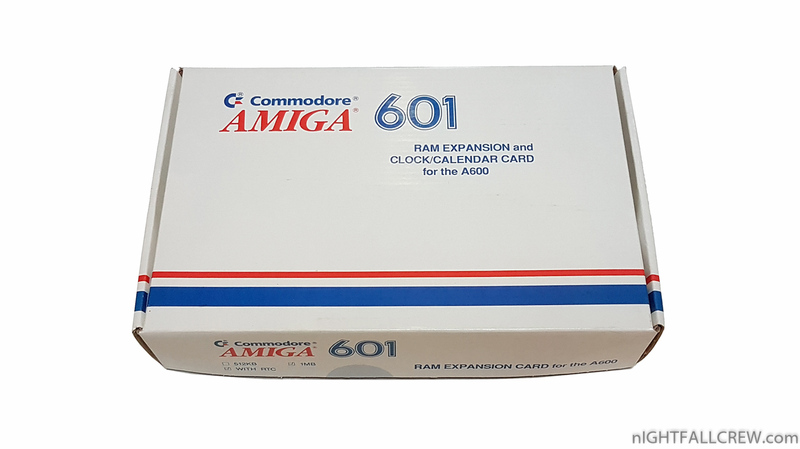 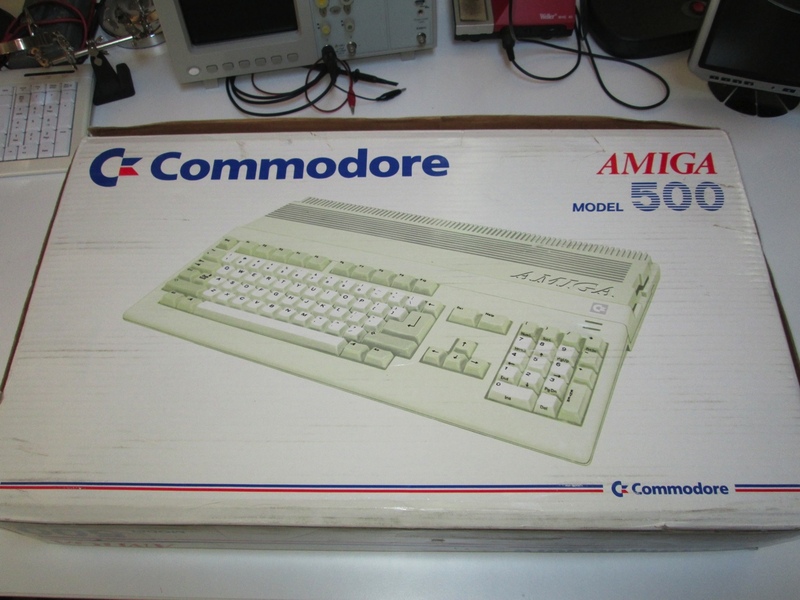 At delivery in 1987, Commodore announced that the Amiga 500 would carry a 699 USD list price. 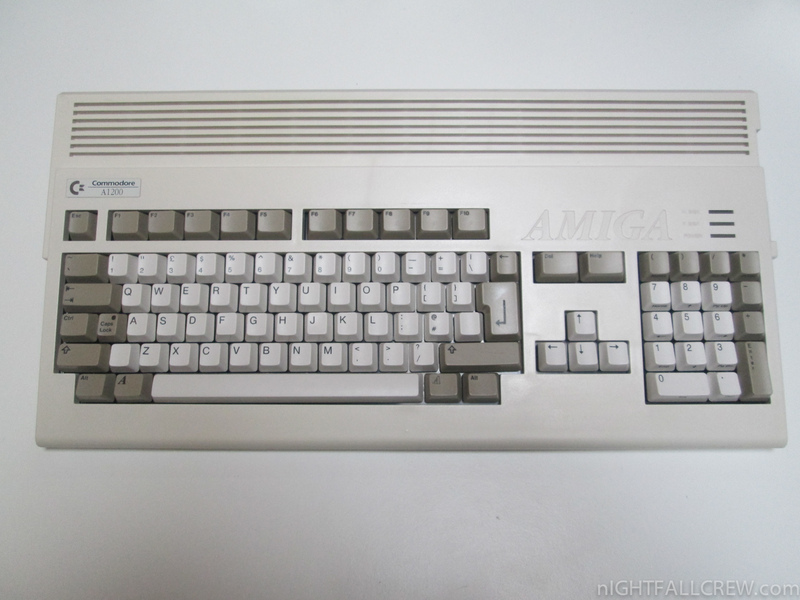 The Amiga 500 series was discontinued in mid-1992 replaced by the similarly specified and priced Amiga 600, although this new machine had originally been intended as a much cheaper budget model, which would have been the A300. 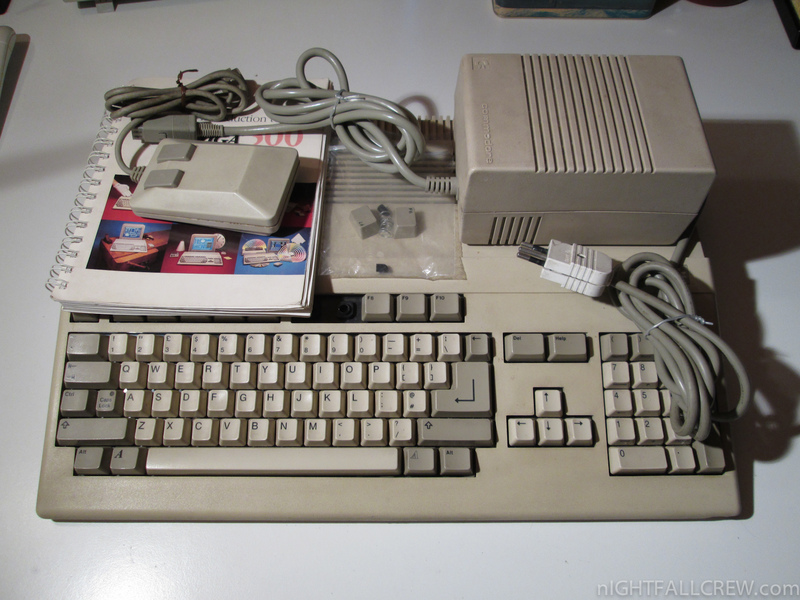 In late 1992, Commodore released the “next-generation” Amiga 1200, a machine closer in concept to the original Amiga 500, but featuring significant technical improvements. 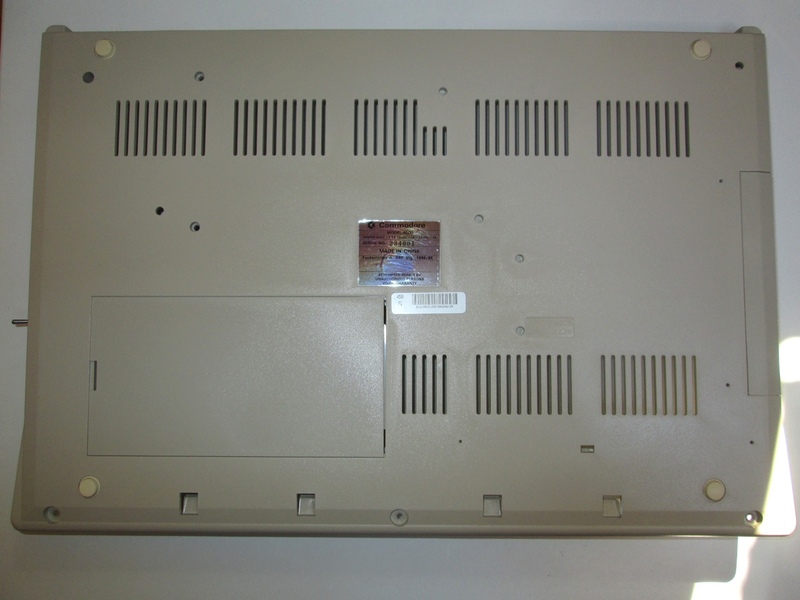 Despite this, neither the A1200 nor the A600 replicated the commercial success of its predecessor as, by this time, the market was definitively shifting from the home computer platforms of the past to commodity Wintel PCs and the new “low-cost” Macintosh Classic, LC and IIsi models. 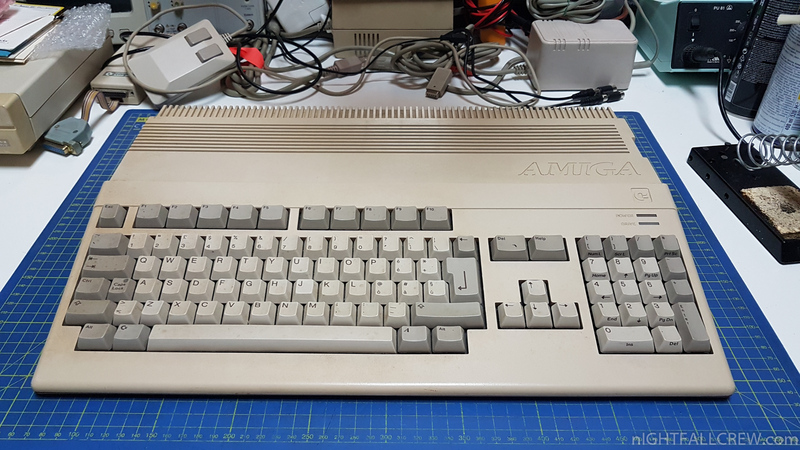 Many years have passed since i sold my Amiga 1000 with Memory Expansion and Harddisk but with some patience and thanks to a friend i have found an Amiga 1000 in good condition for my RetroComputer museum. 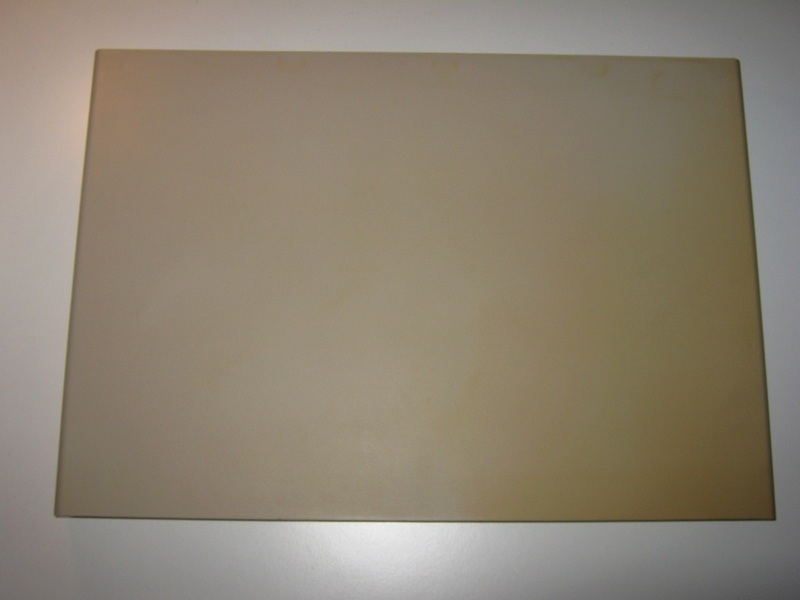 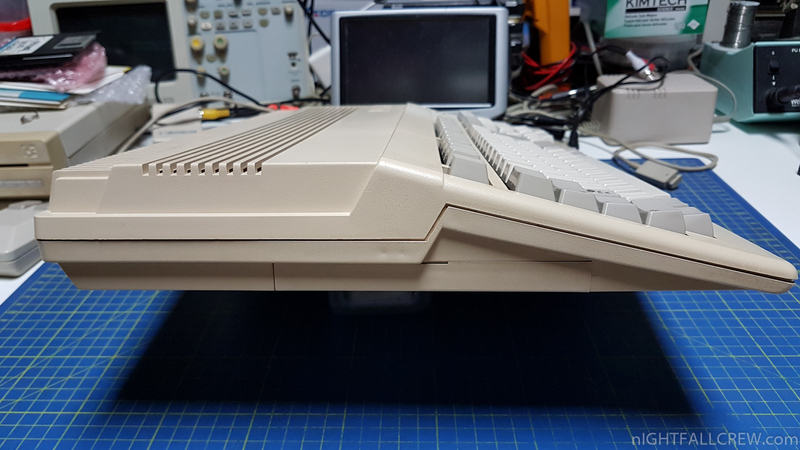 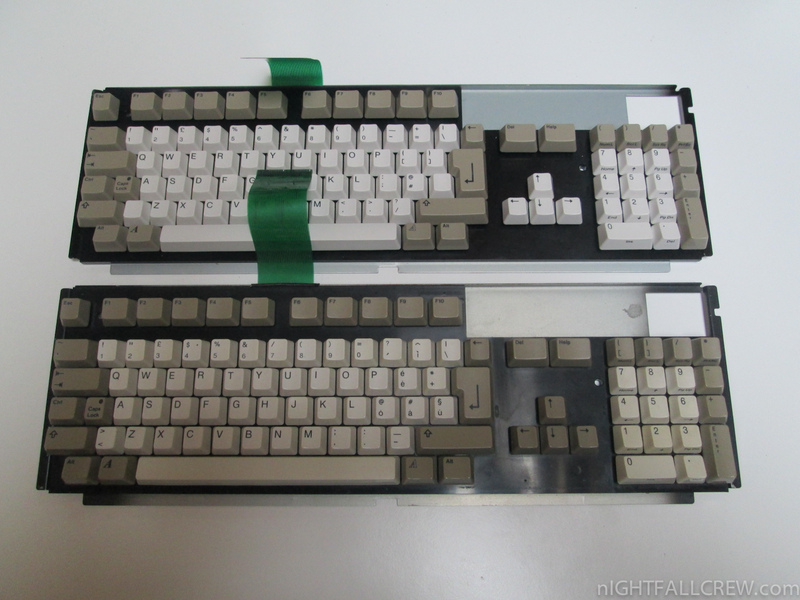 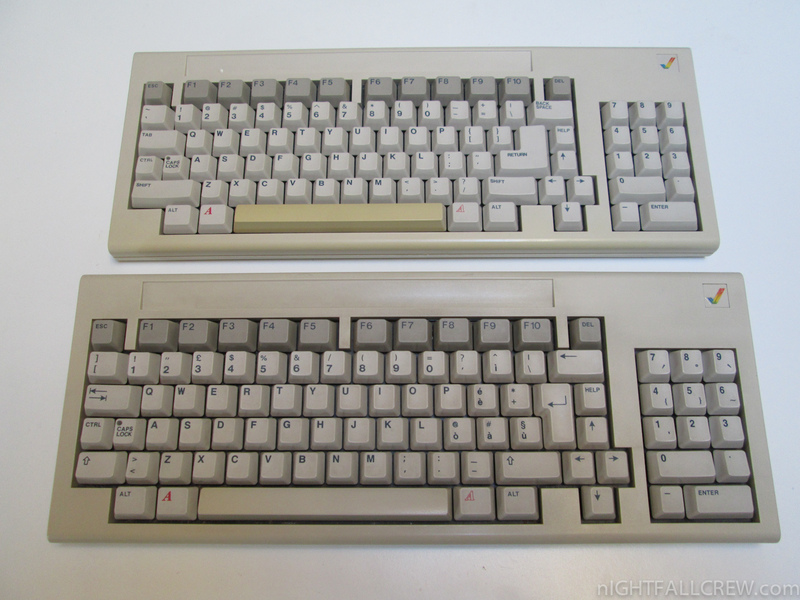 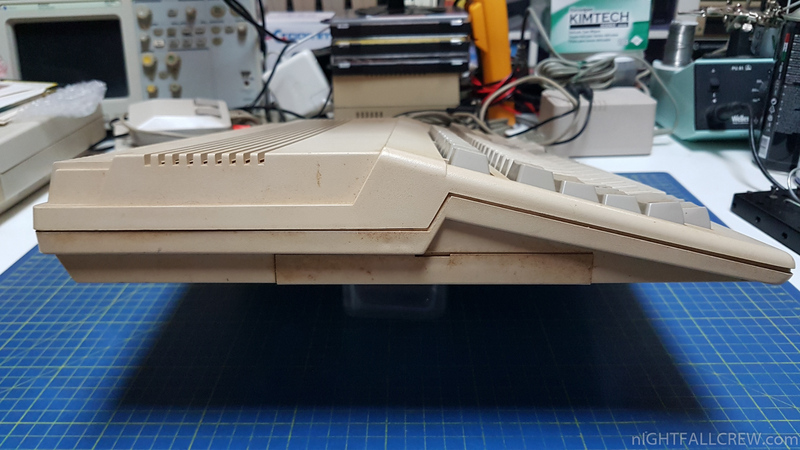 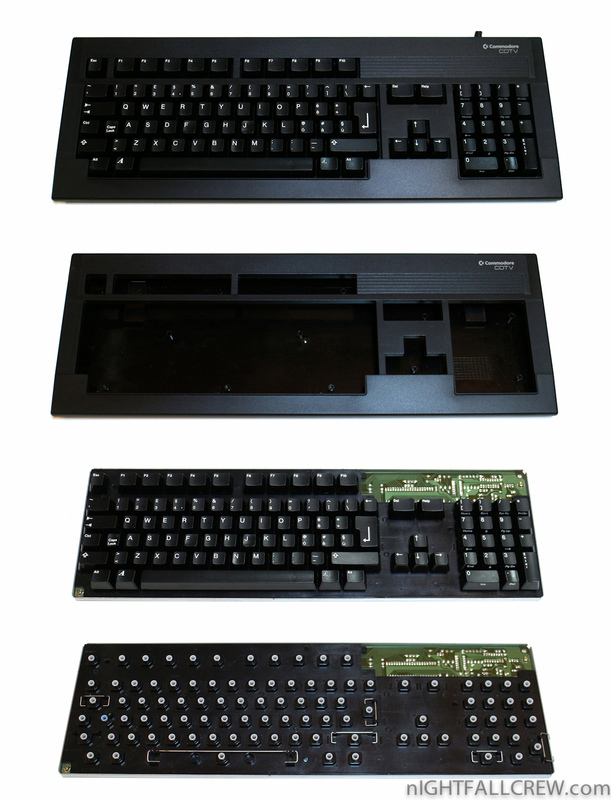 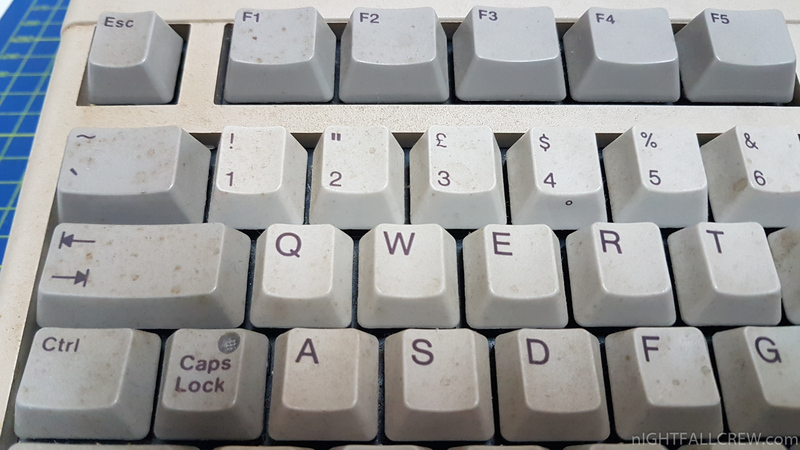 As you can see from the photos i have changed the yellowed keyboard cover with a new one that was sold many years ago for Commodore spare parts. 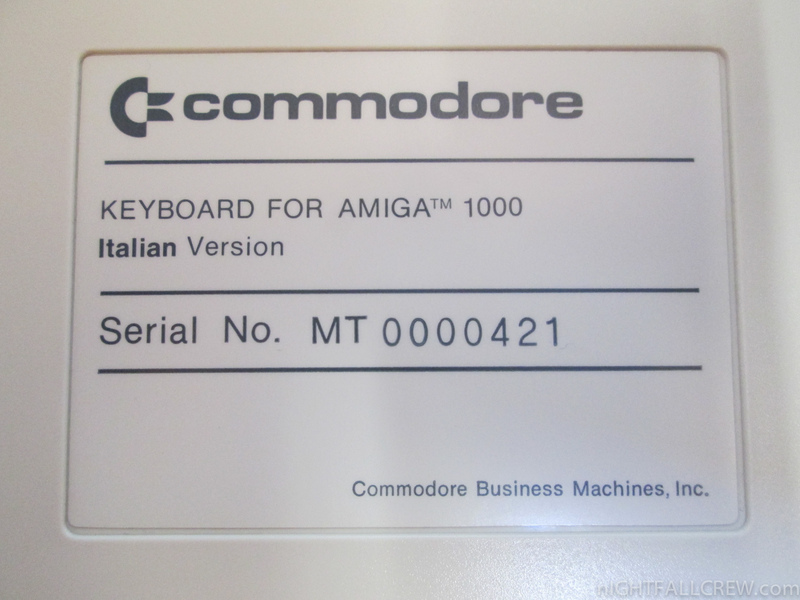 The A1000, or Commodore Amiga 1000, was Commodore’s initial Amiga personal computer, introduced on July 23, 1985 at the Lincoln Center in New York City. 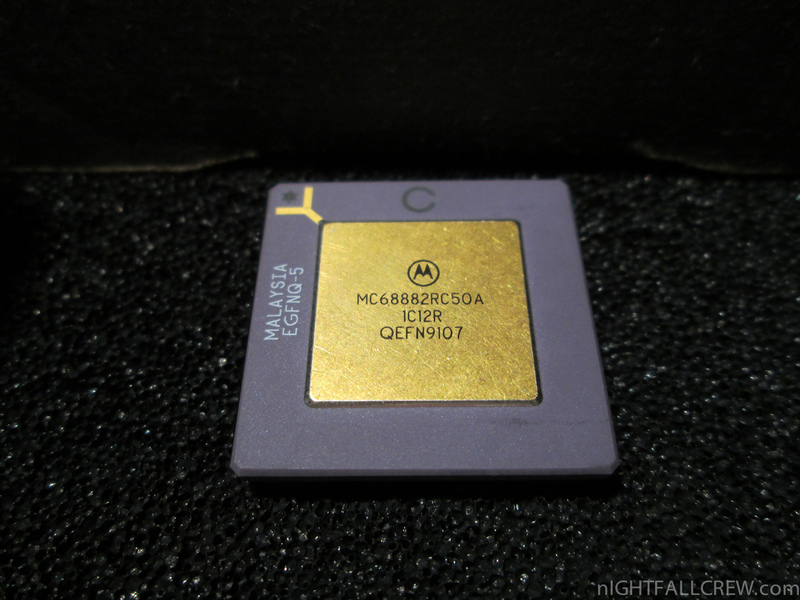 Machines began shipping in September with a base configuration of 256 kB of RAM at the retail price of 1,295 USD. 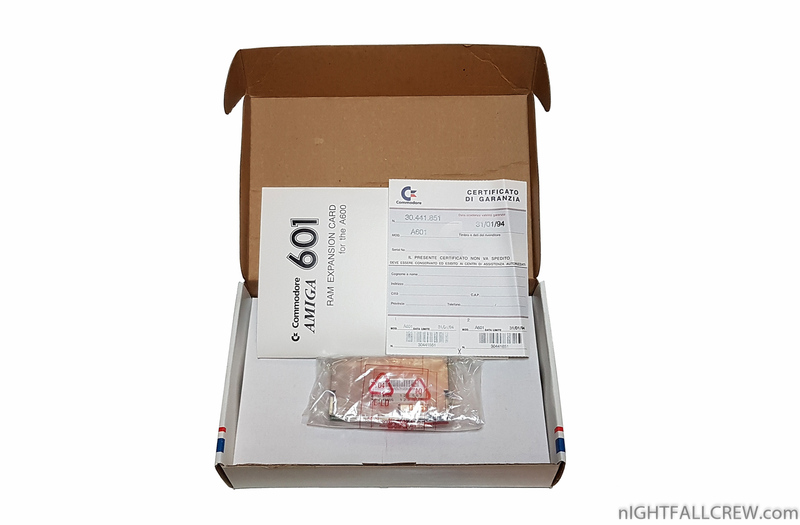 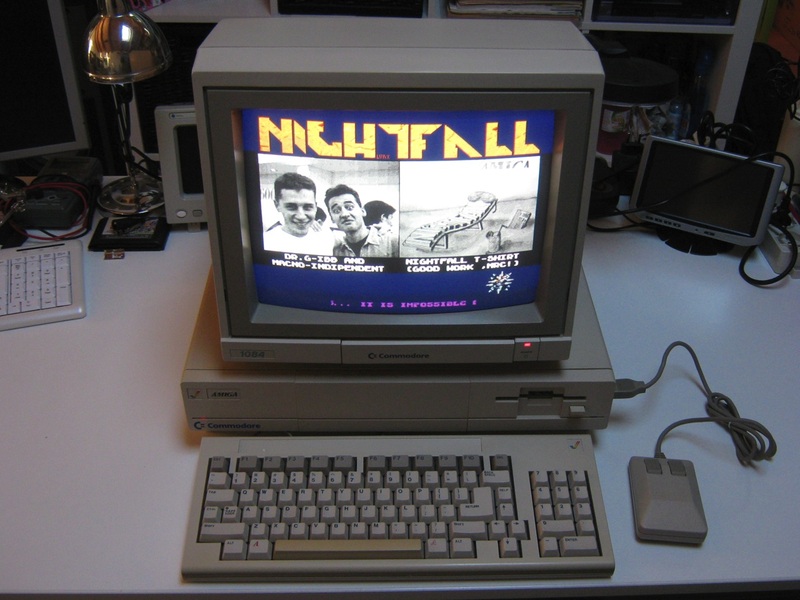 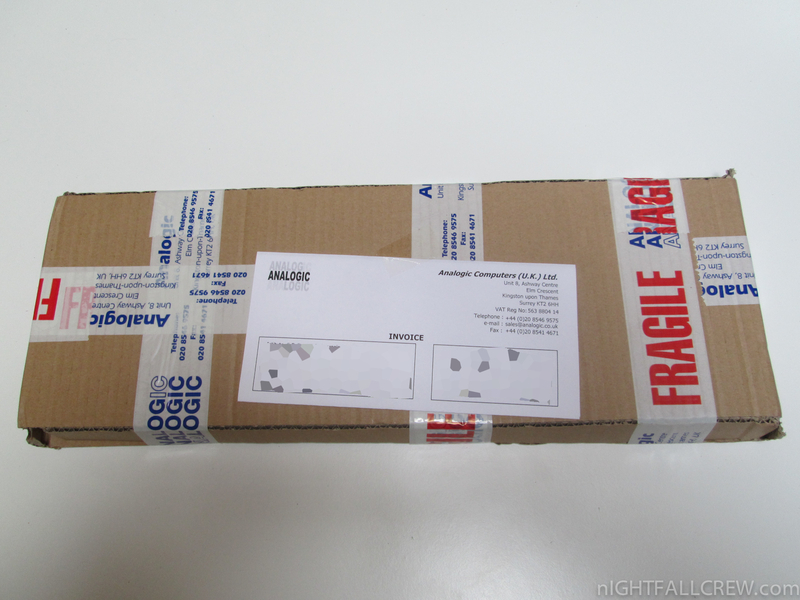 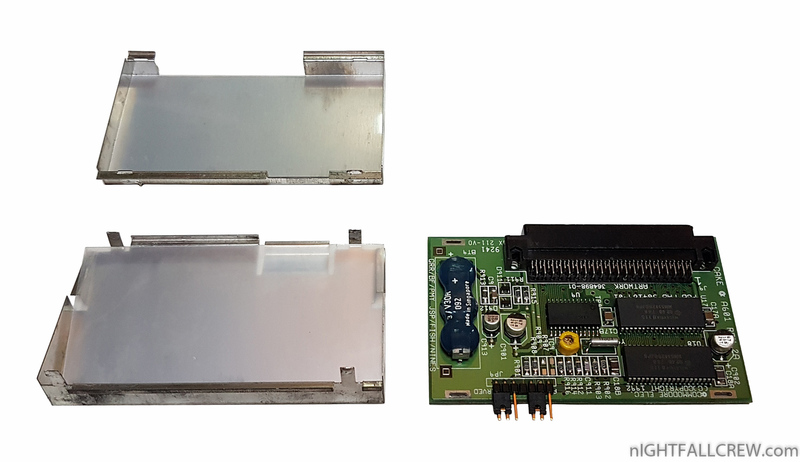 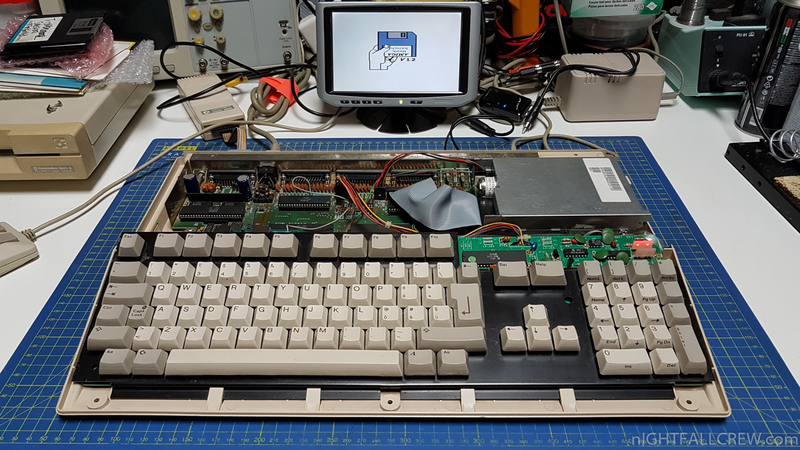 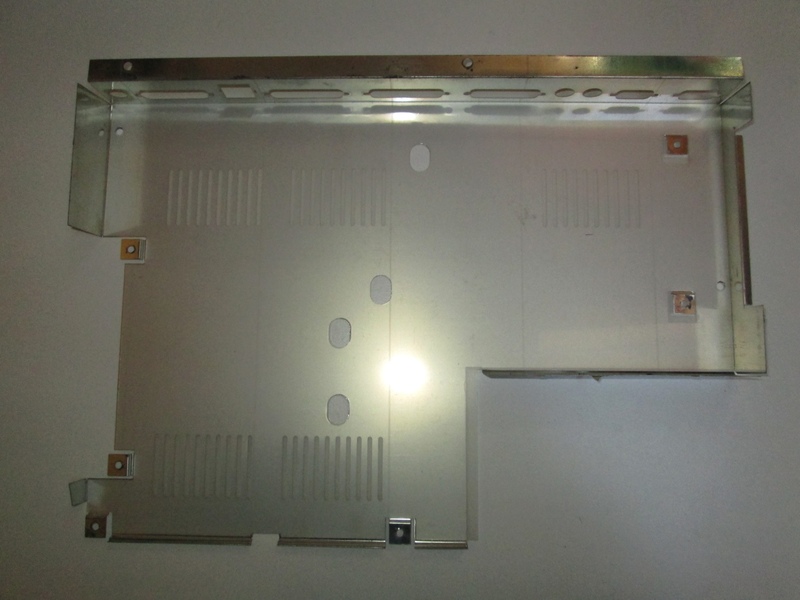 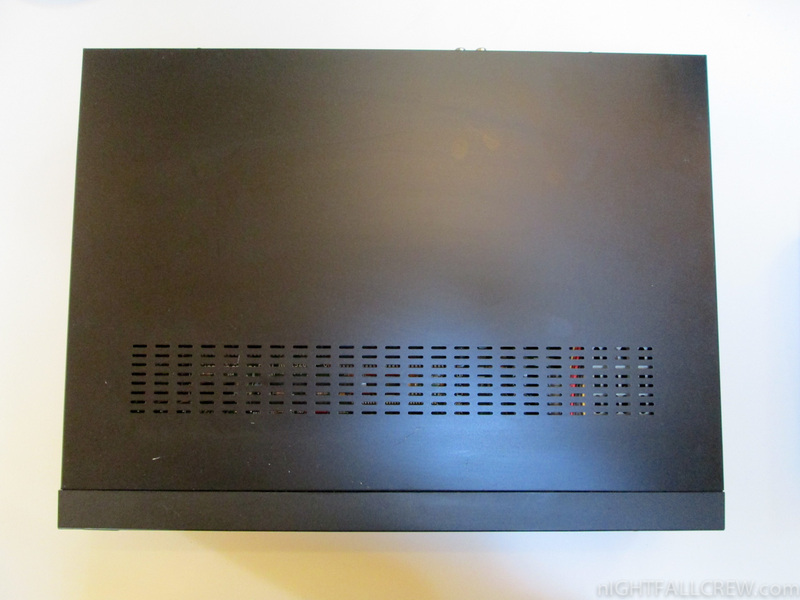 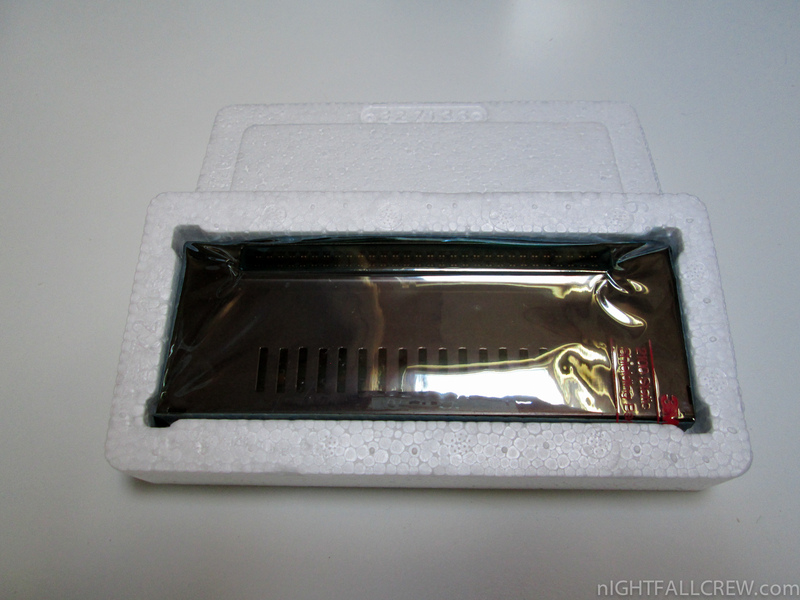 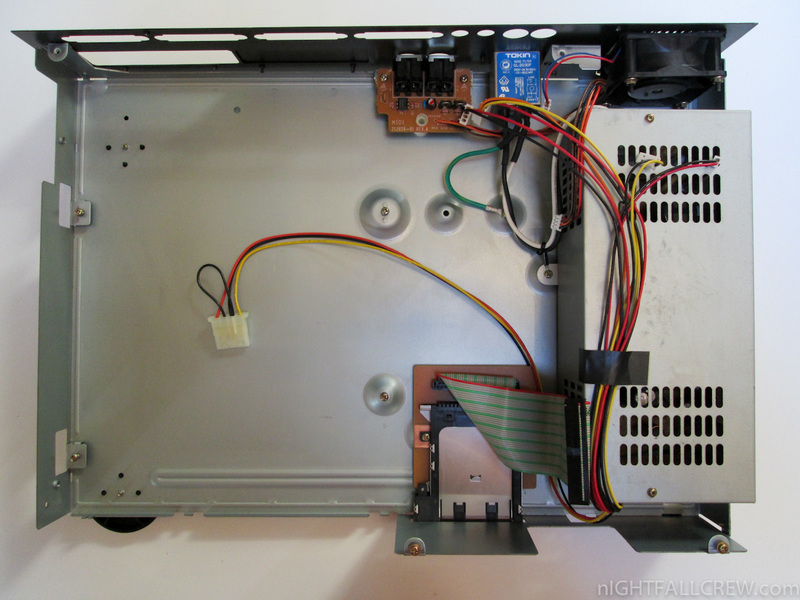 A 13-inch (330 mm) analog RGB monitor was available for around 300 USD bringing the price of a complete Amiga system to 1,595 USD. 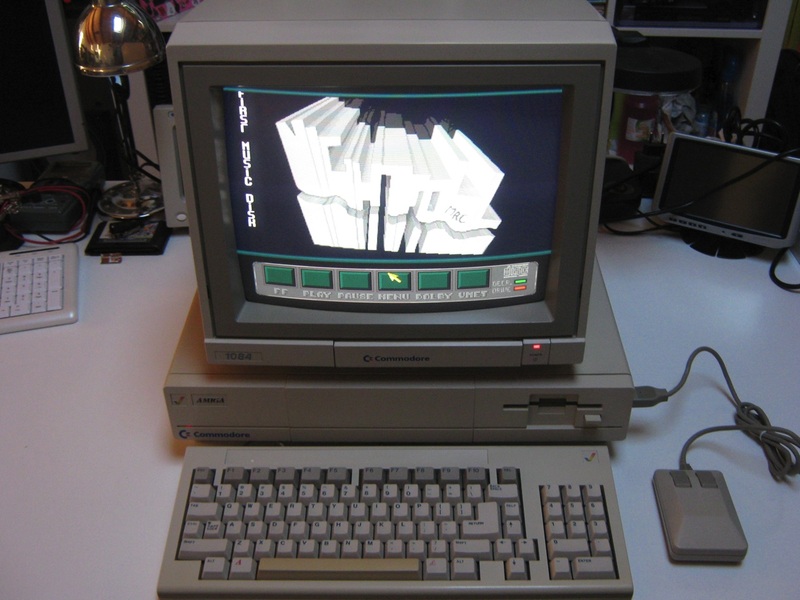 Before the release of the Amiga 500 and A2000 models in 1987, the A1000 was simply called Amiga. 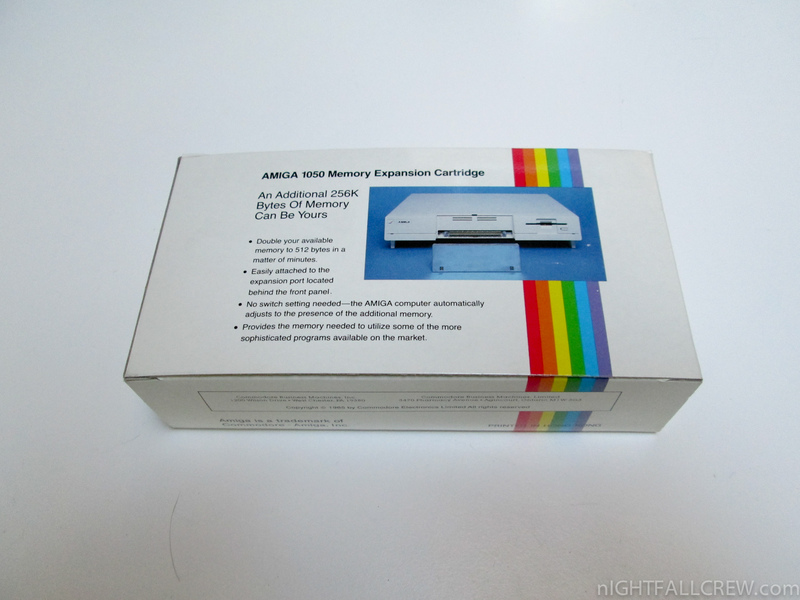 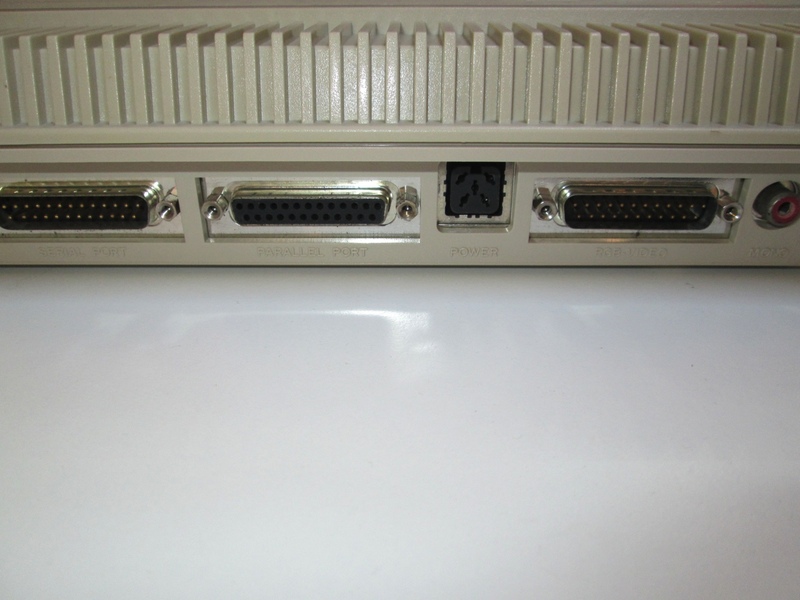 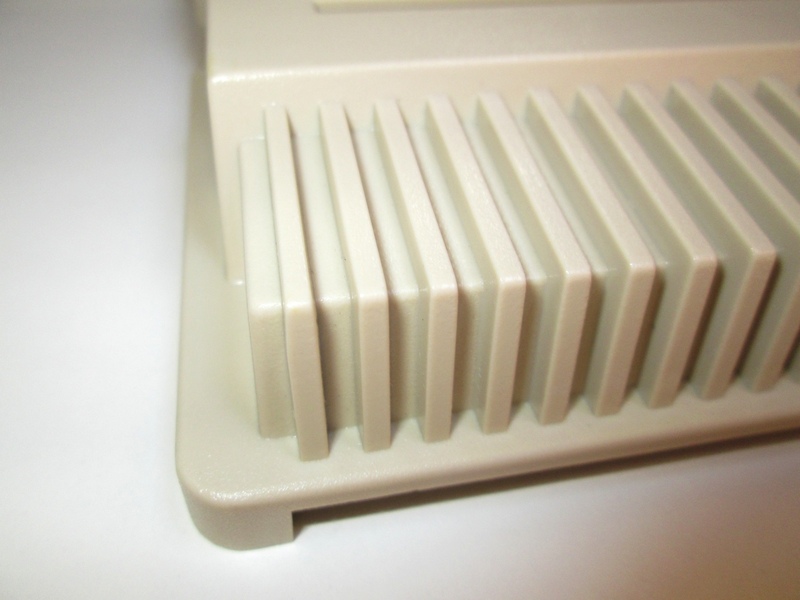 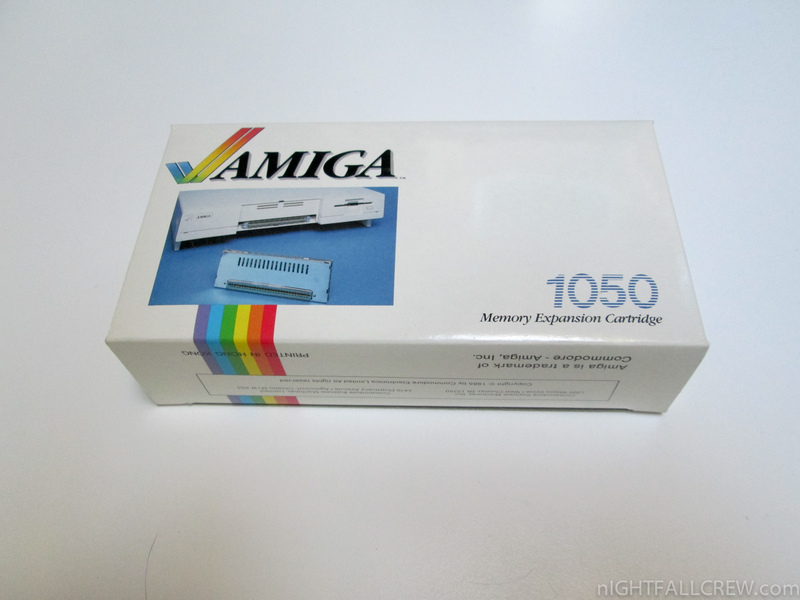 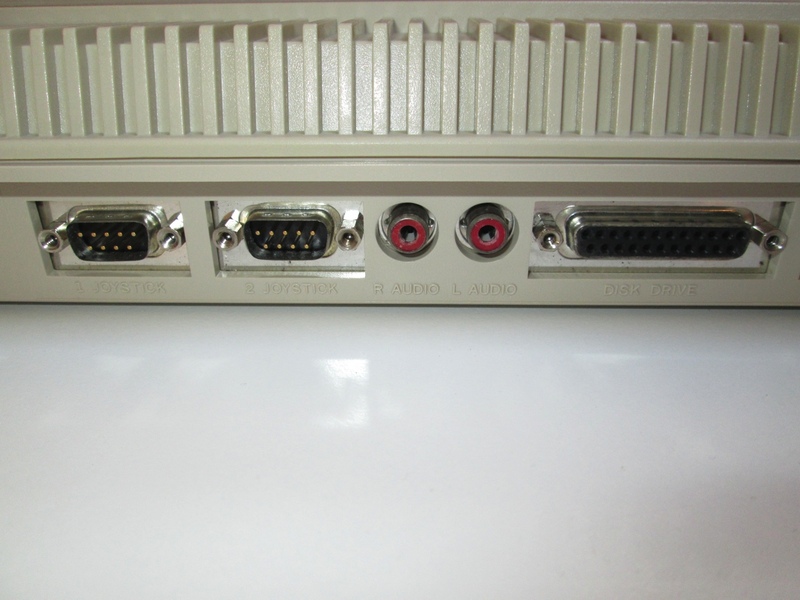 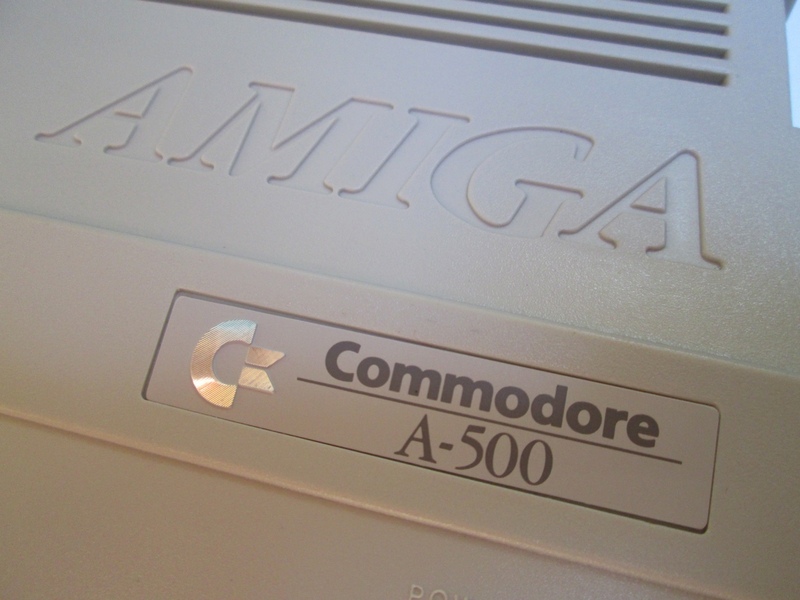 In the US, the A1000 was marketed as The Amiga from Commodore, however the Commodore logo was omitted from the casing. 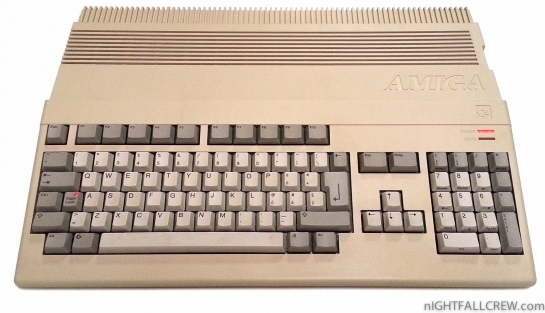 Additionally the Amiga 1000 was exclusively sold in computer stores, rather than the various non computer-dedicated department and toy stores the VIC20 and Commodore 64 were retailed in. 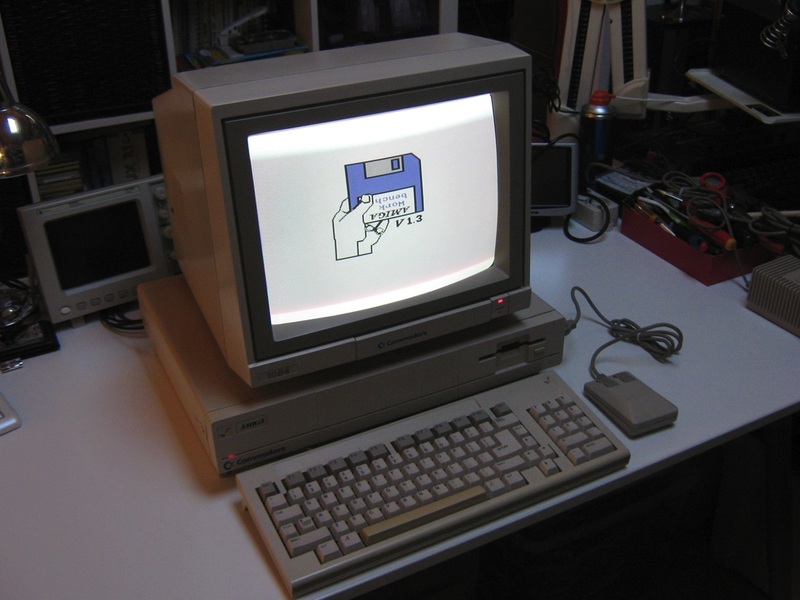 These measures were an effort to avoid Commodore’s “toy-store” computer image created during the Tramiel era. 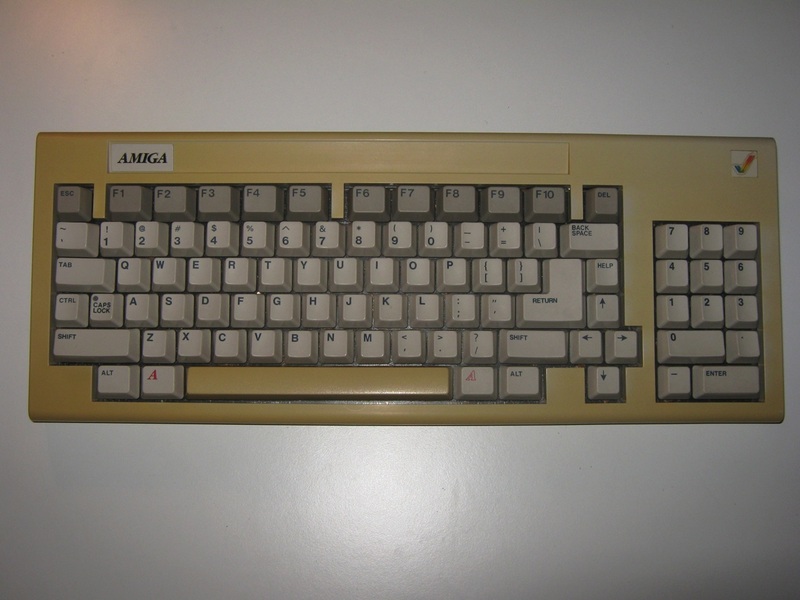 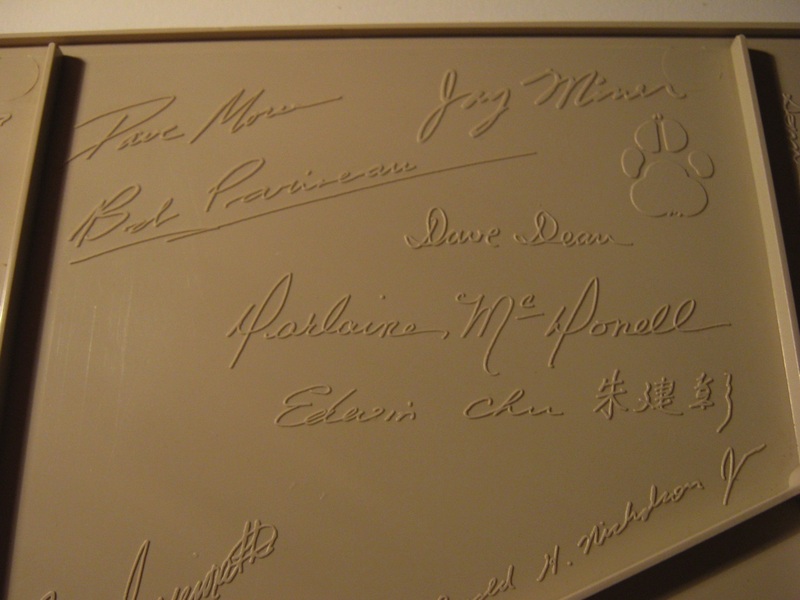 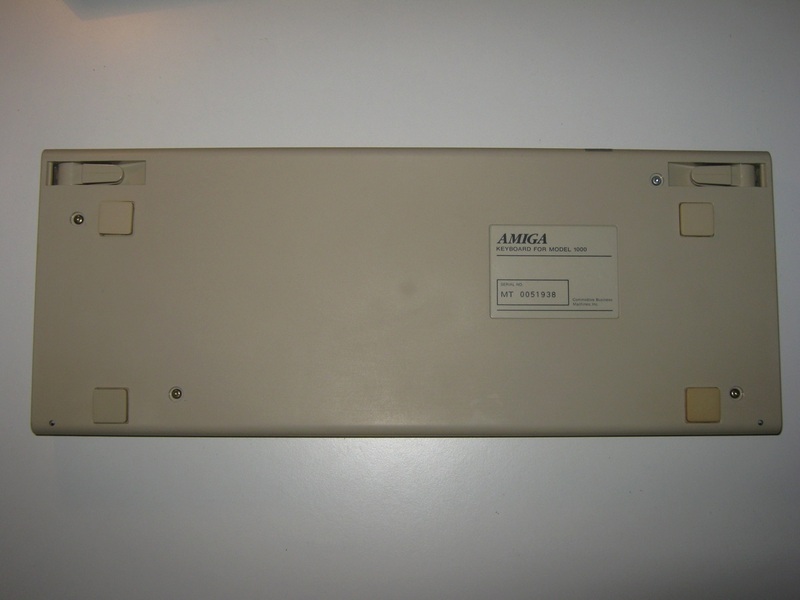 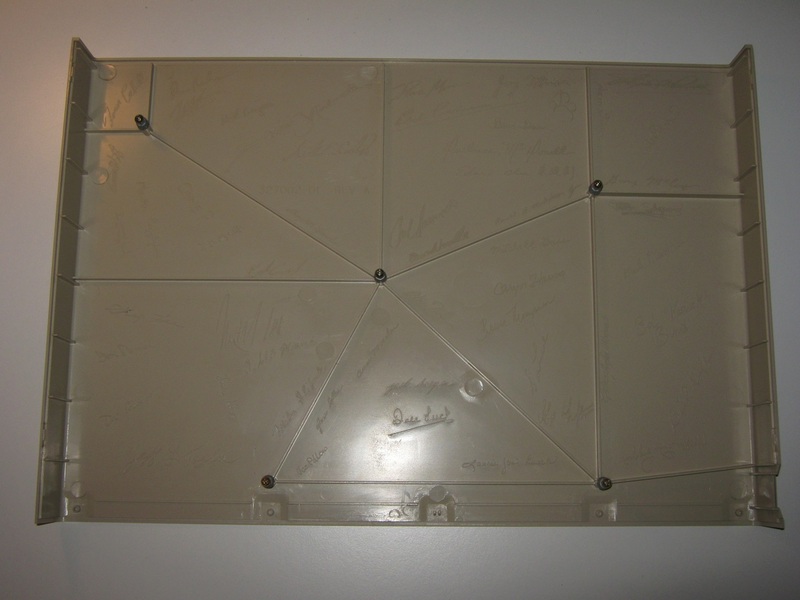 The A1000 had a number of characteristics that distinguished it from later Amiga models: It was the only model to feature the short-lived Amiga “checkmark” logo on its case; the case was elevated slightly to give a storage area for the keyboard when not in use (a “keyboard garage”); and the inside of the case was engraved with the signatures of the Amiga designers (similar to the Macintosh), including Jay Miner, and the paw print of his dog Mitchy. 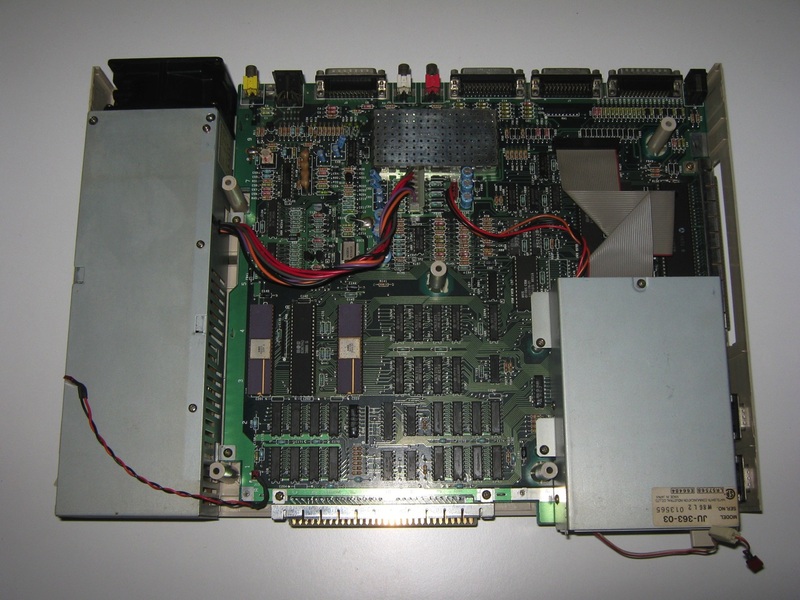 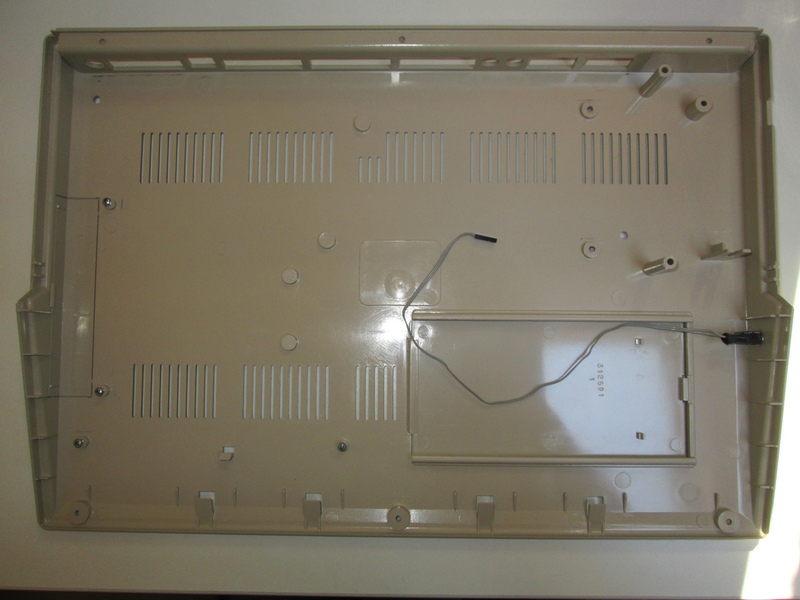 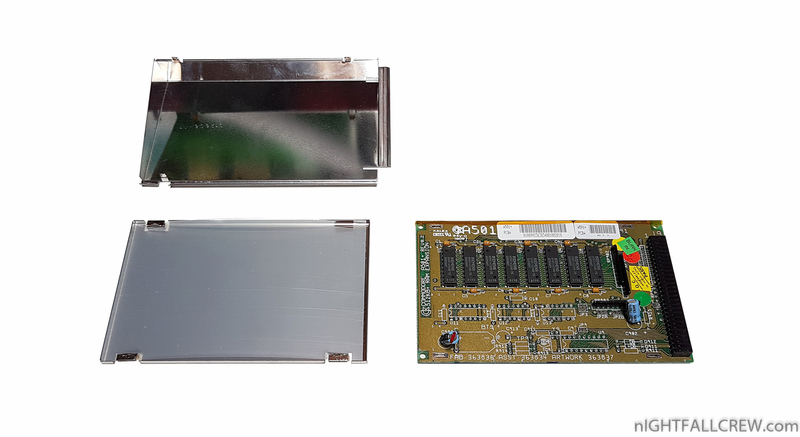 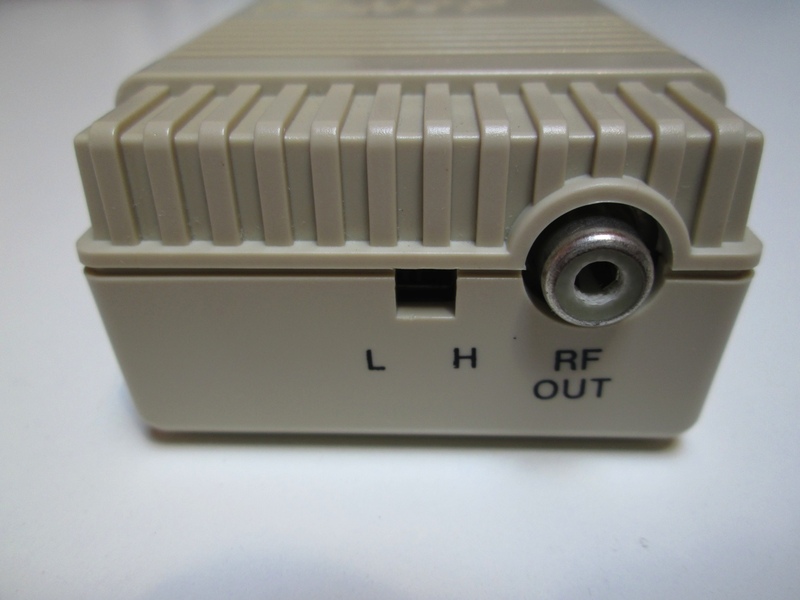 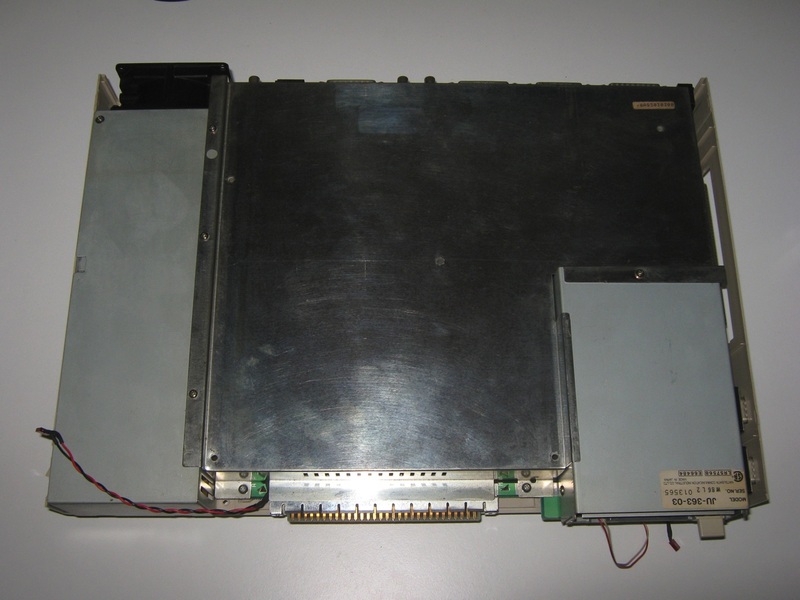 The A1000′s case was designed by Howard Stolz As Senior Industrial Designer at Commodore, Stolz was the mechanical lead and primary interface with Sanyo in Japan, the contract manufacturer for the A1000 casing.